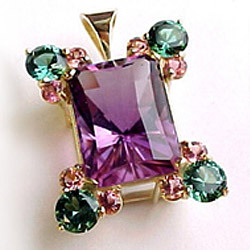 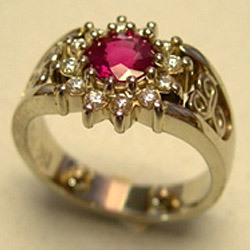 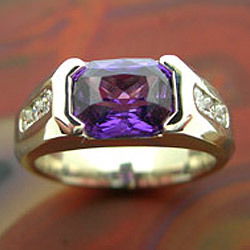 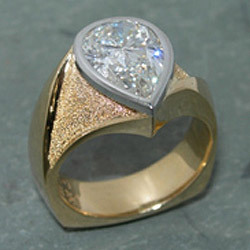 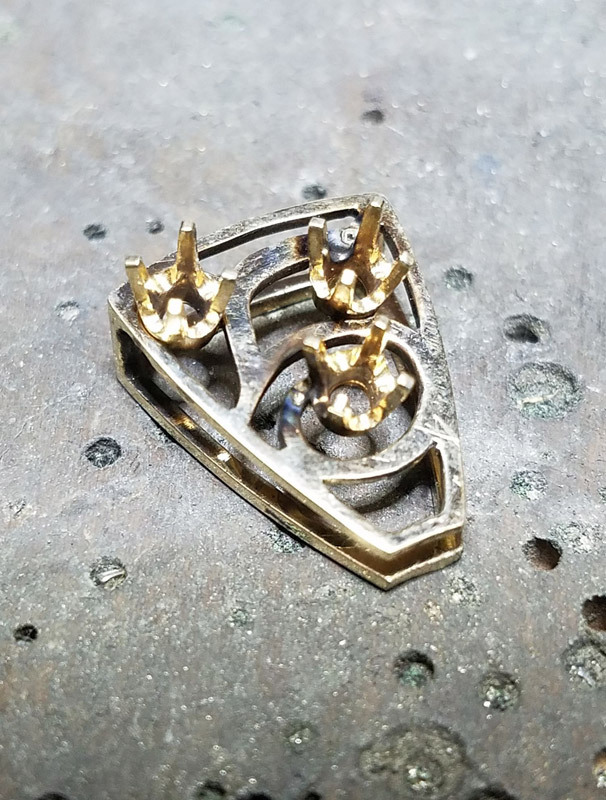 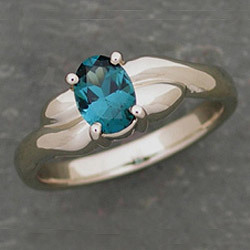 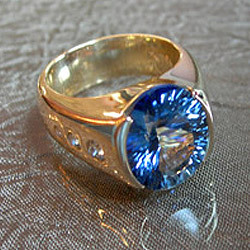 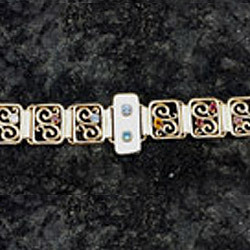 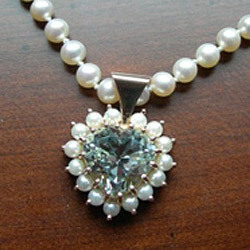 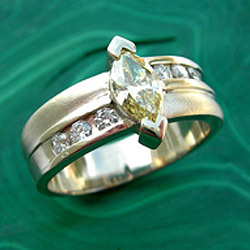 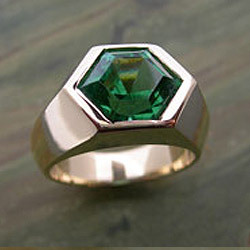 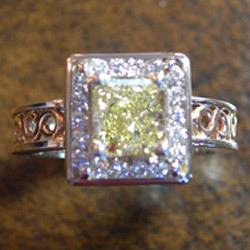 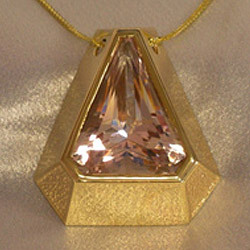 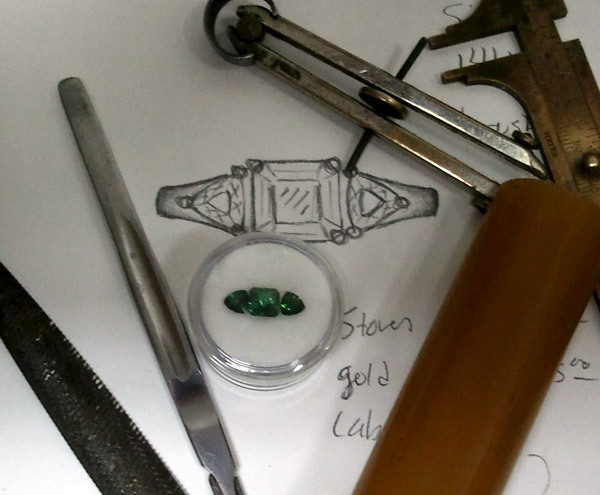 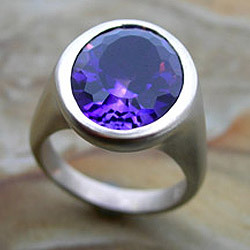 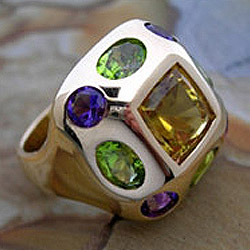 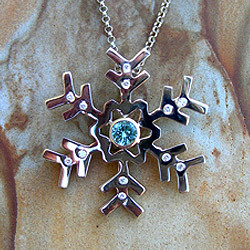 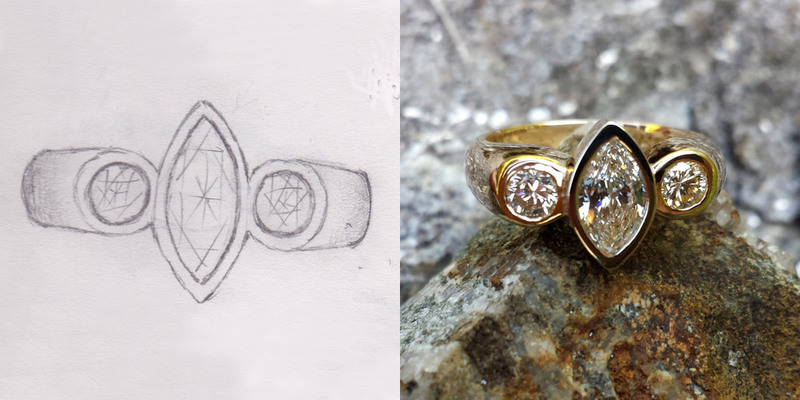 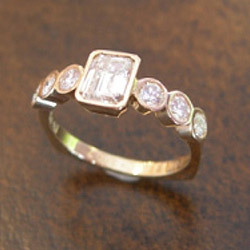 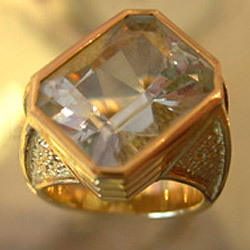 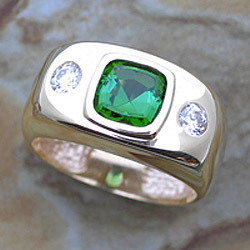 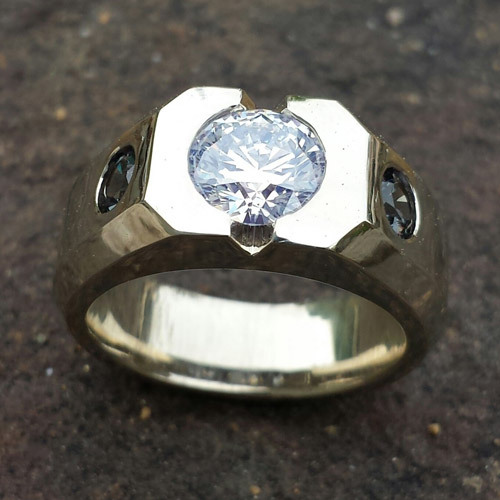 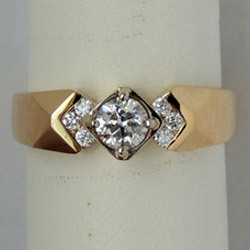 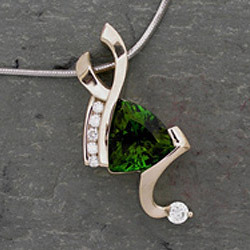 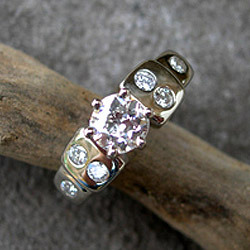 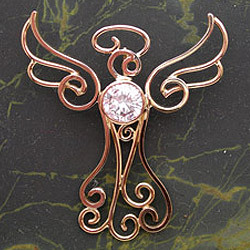 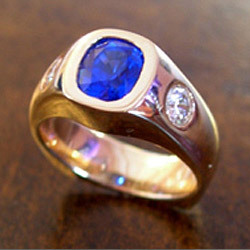 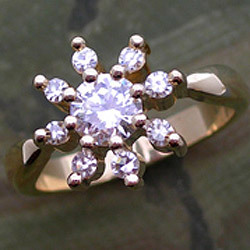 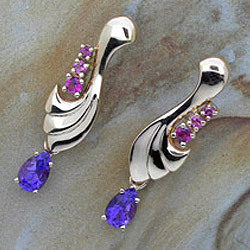 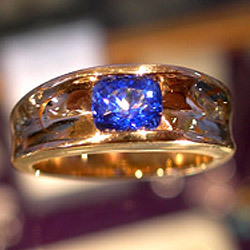 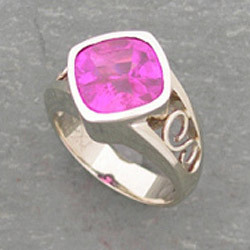 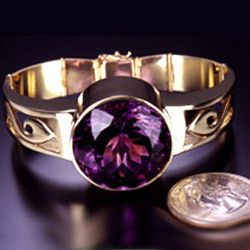 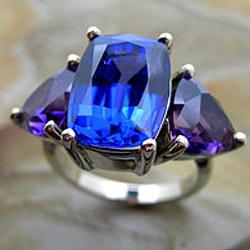 One of our specialties at Creaser Jewelers is our custom jewelry design service. 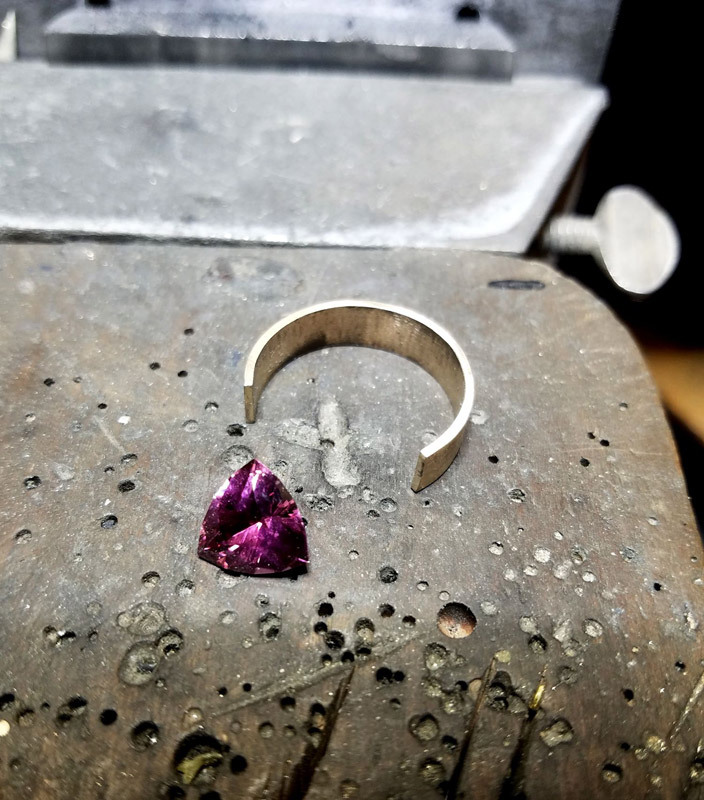 There is perhaps nothing as satisfying to me as a designer and as an artist than the look on the face of a satisfied custom jewelry client. 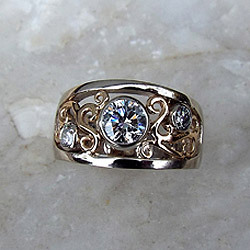 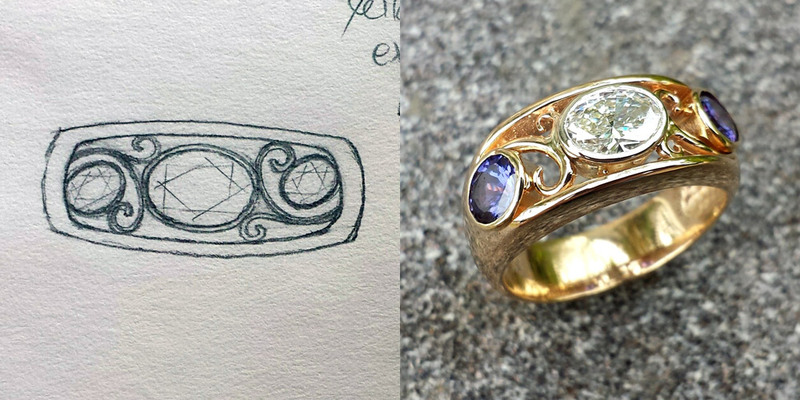 Turning ideas into heirloom-quality expressions of love is one of my favorite jobs- if I can call it a job. 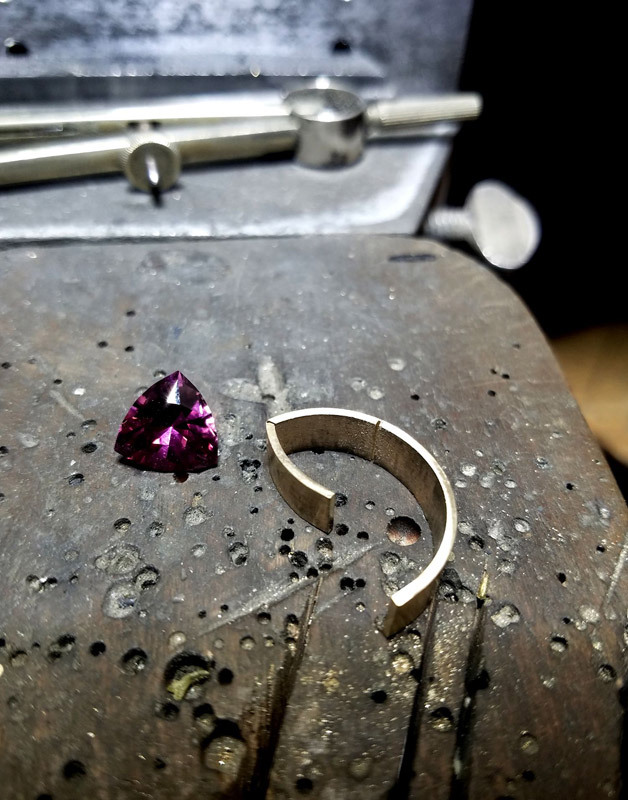 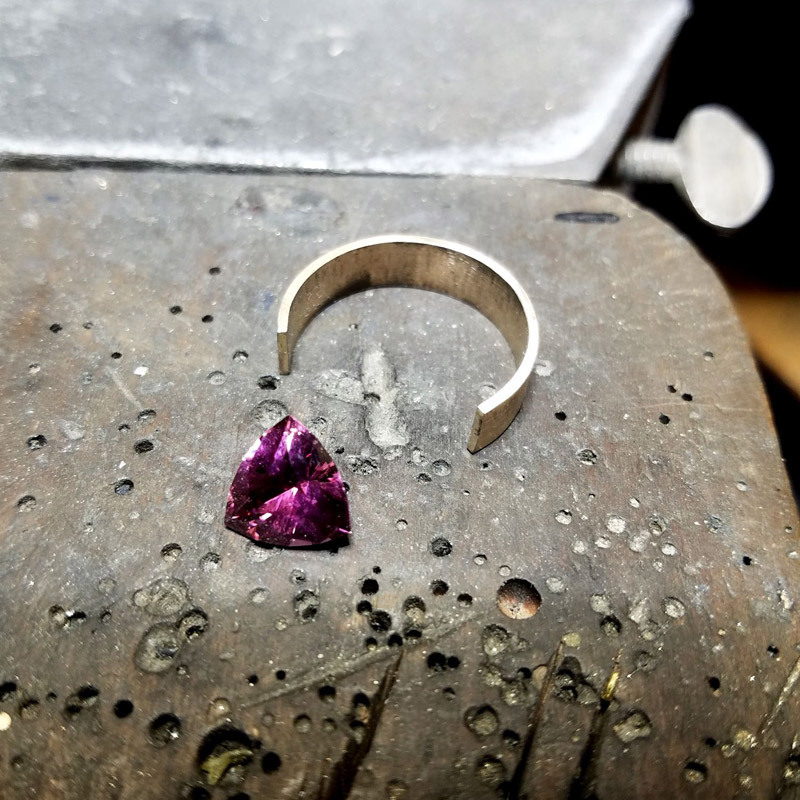 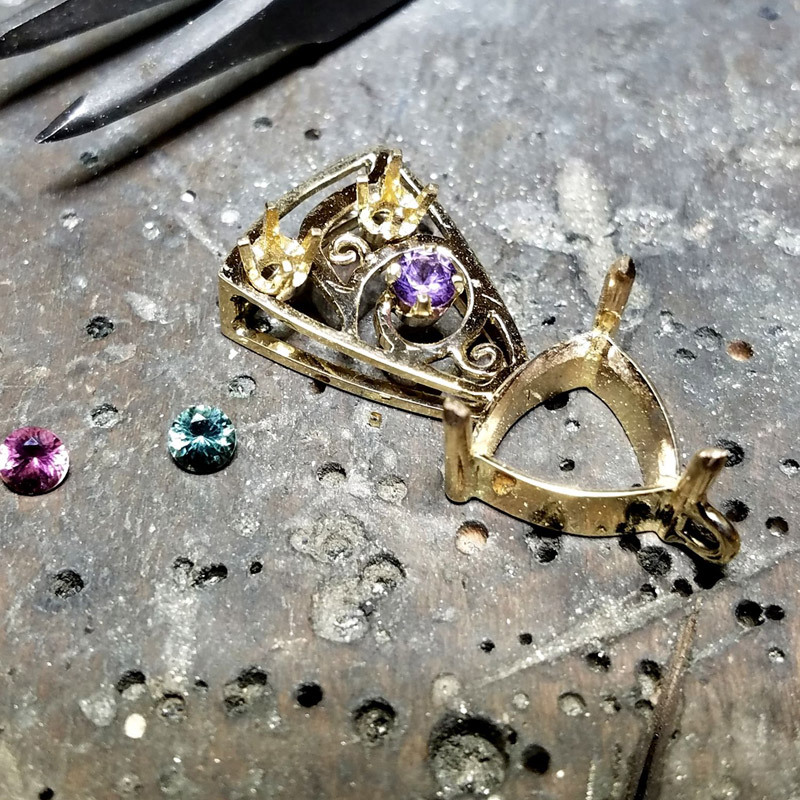 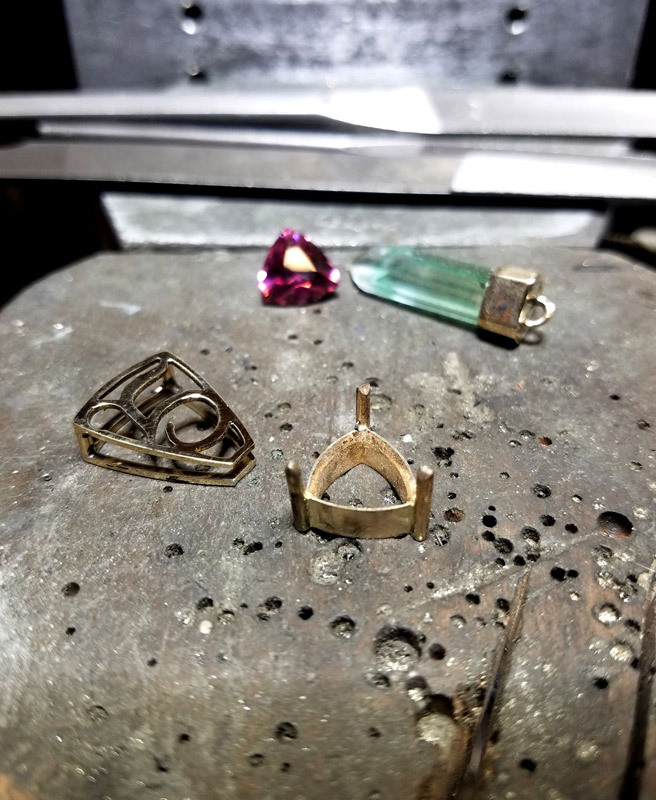 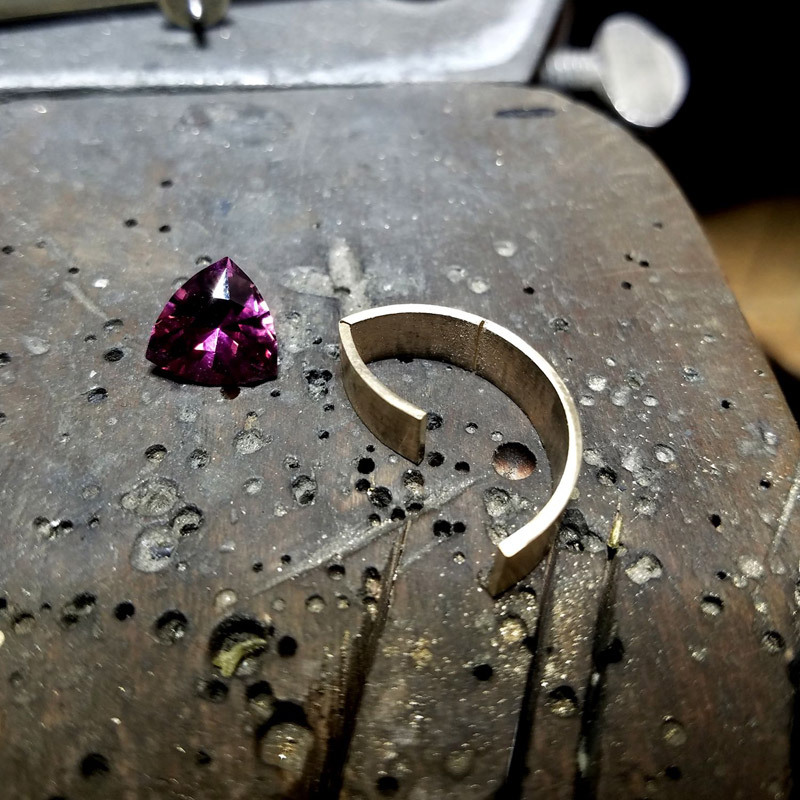 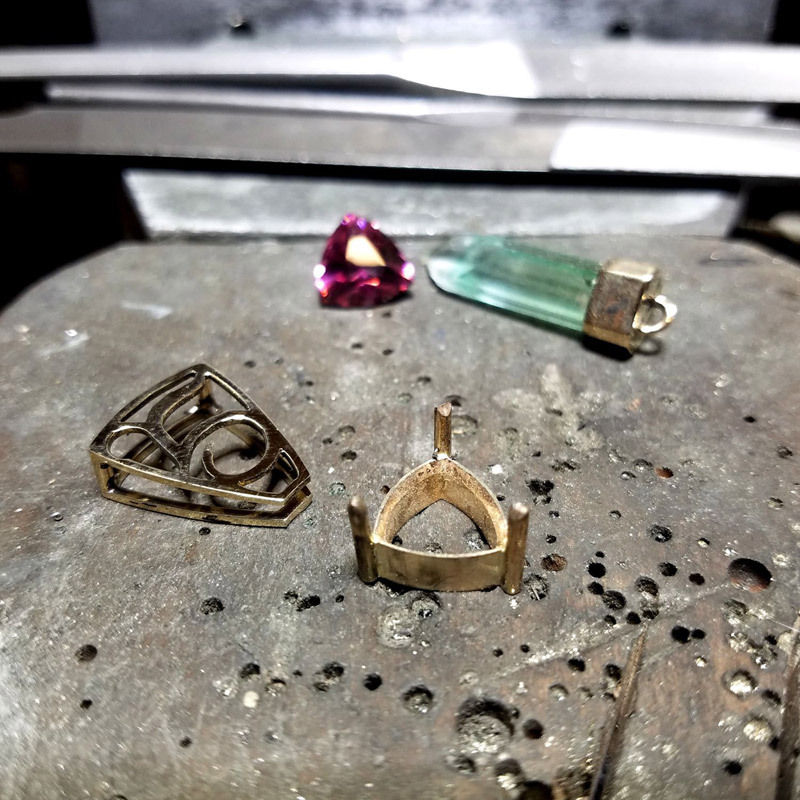 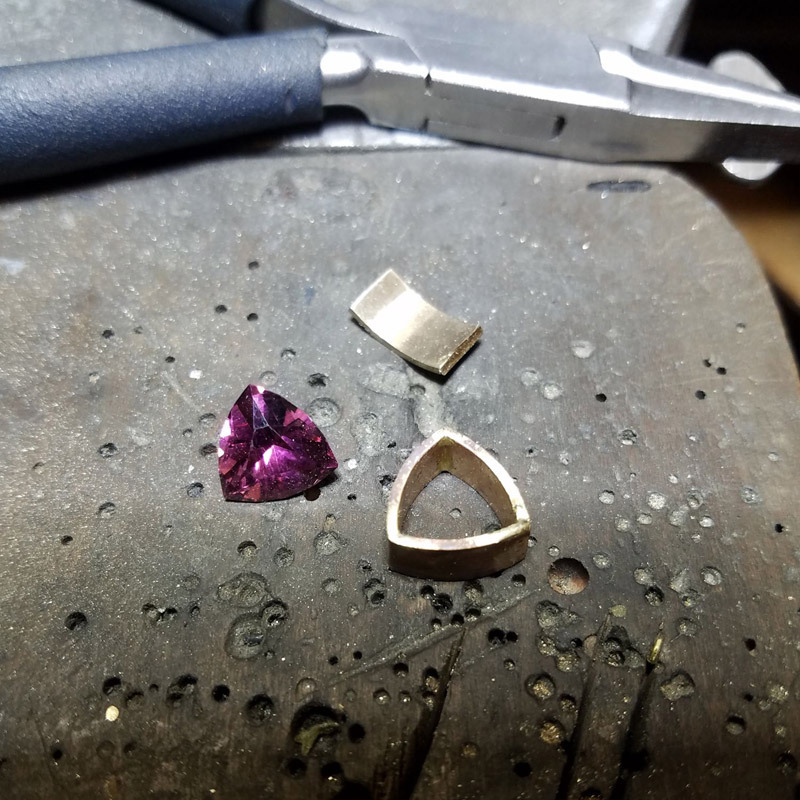 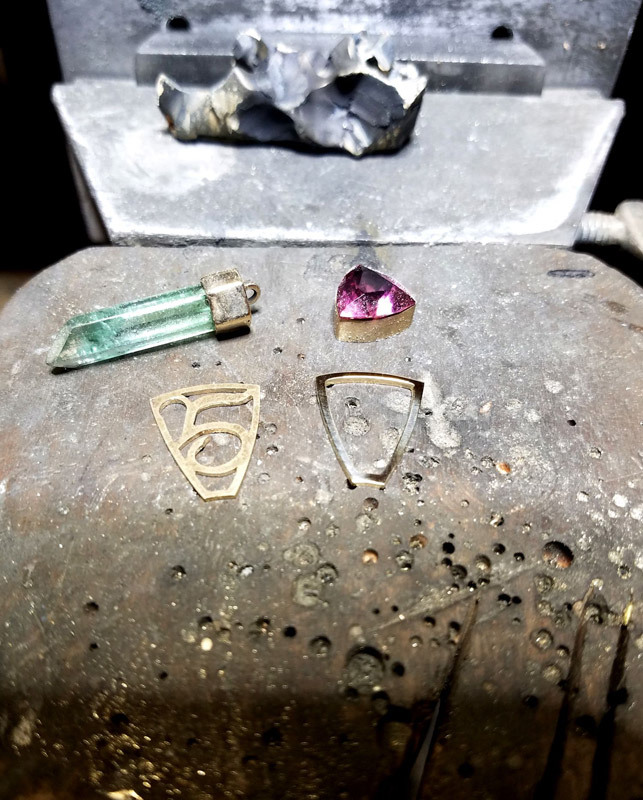 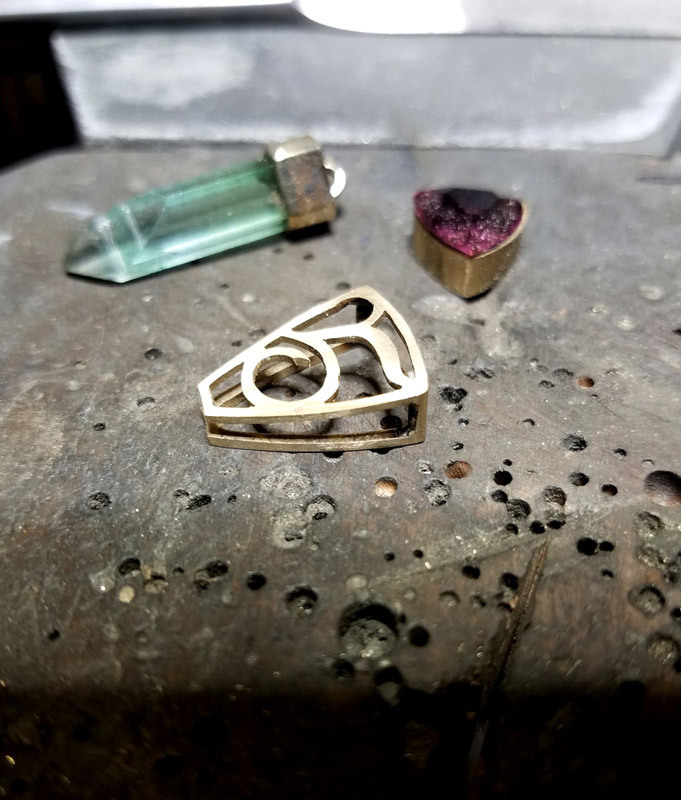 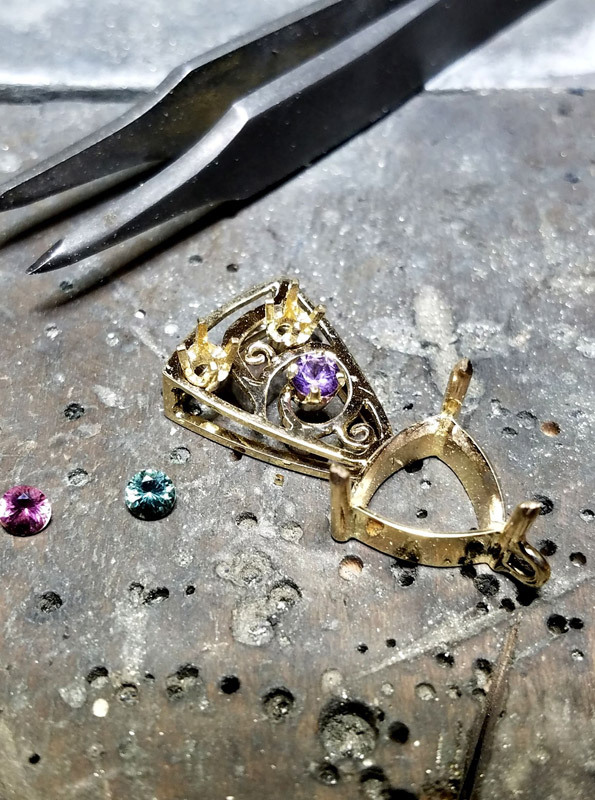 Each piece starts with a challenge, a possibility, a question… "I want to use my grandmother's diamond in a new ring for my daughter's engagement ring. 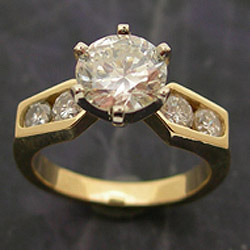 Can you design something modern yet classic? 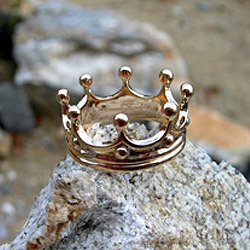 Something she can wear every day?" 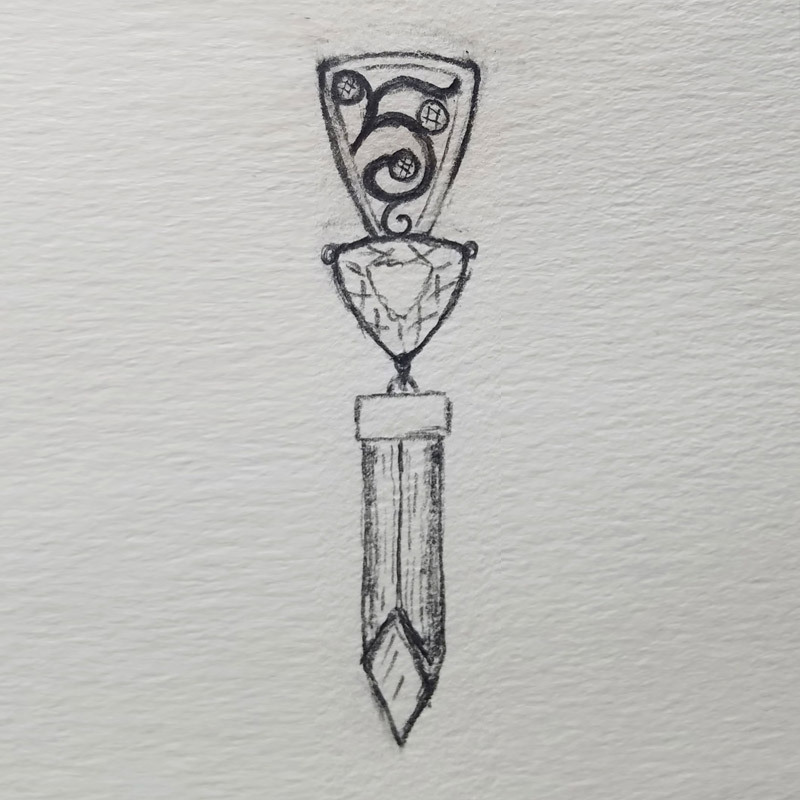 And the adventure begins. 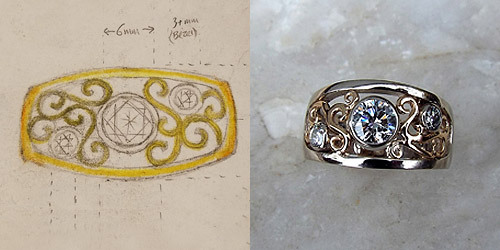 At the end, another beautiful creation, another happy customer and another picture for my portfolio. 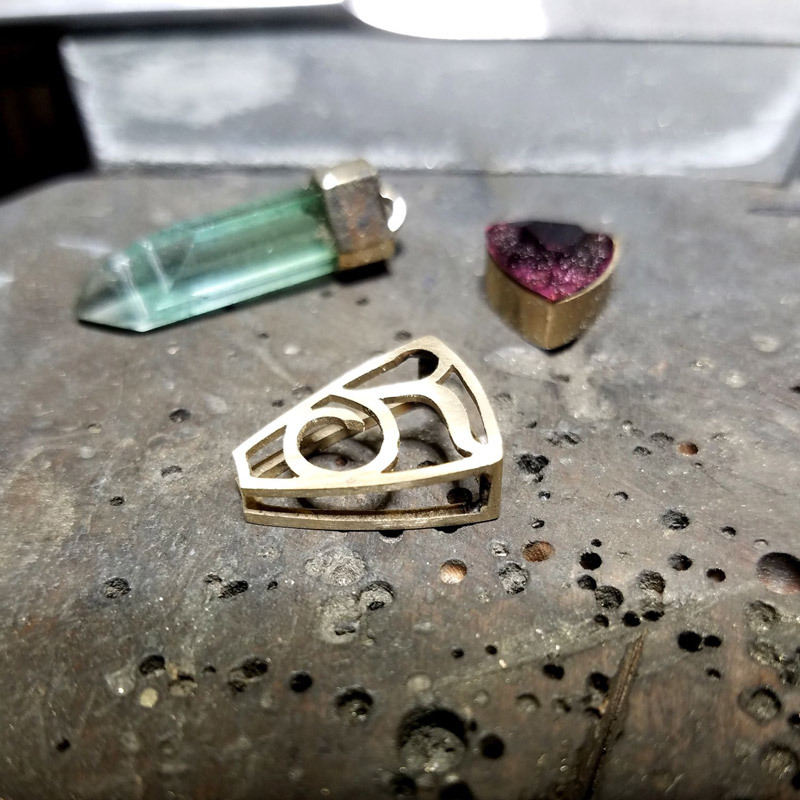 Is there something I can make for you? 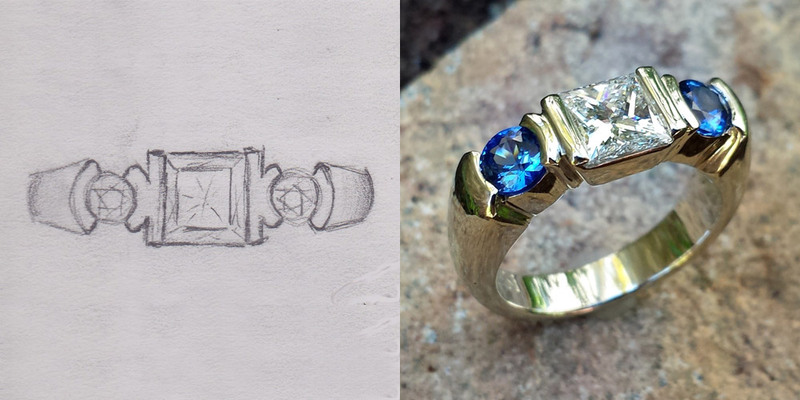 The following is a selection of sketches and pictures of finished pieces that we have designed and created for our customers. 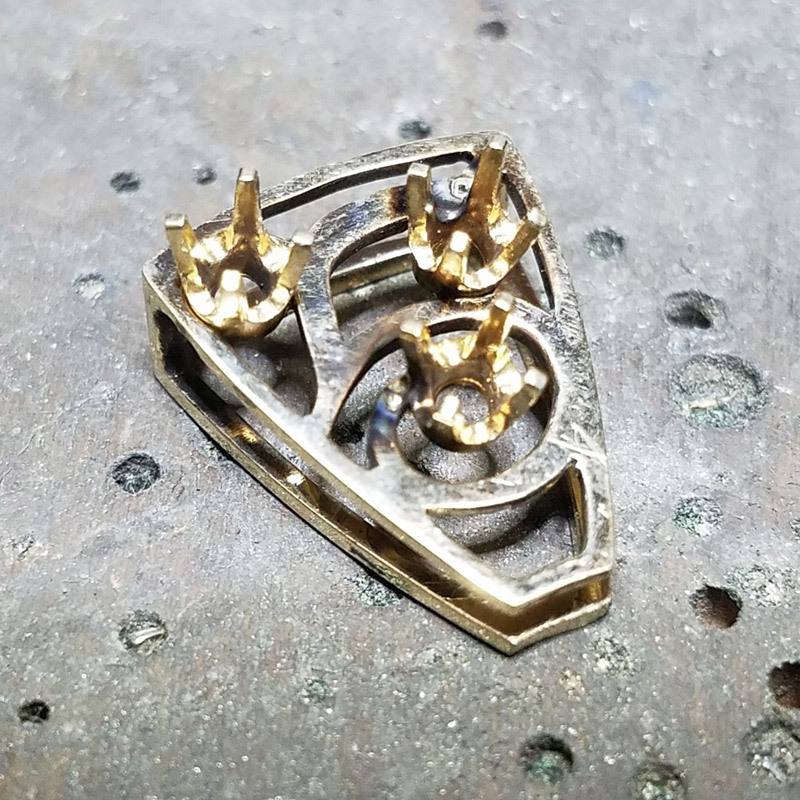 Click each row to learn more. 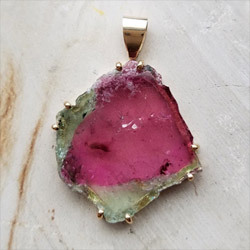 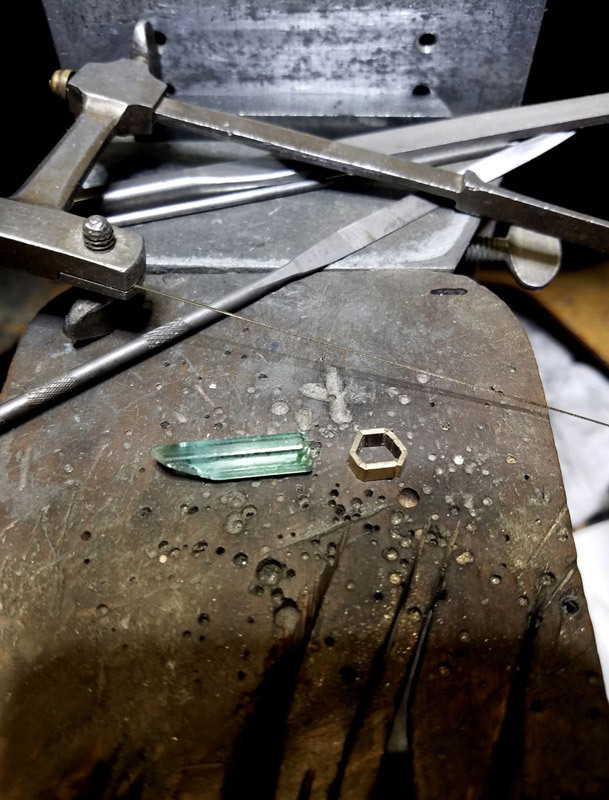 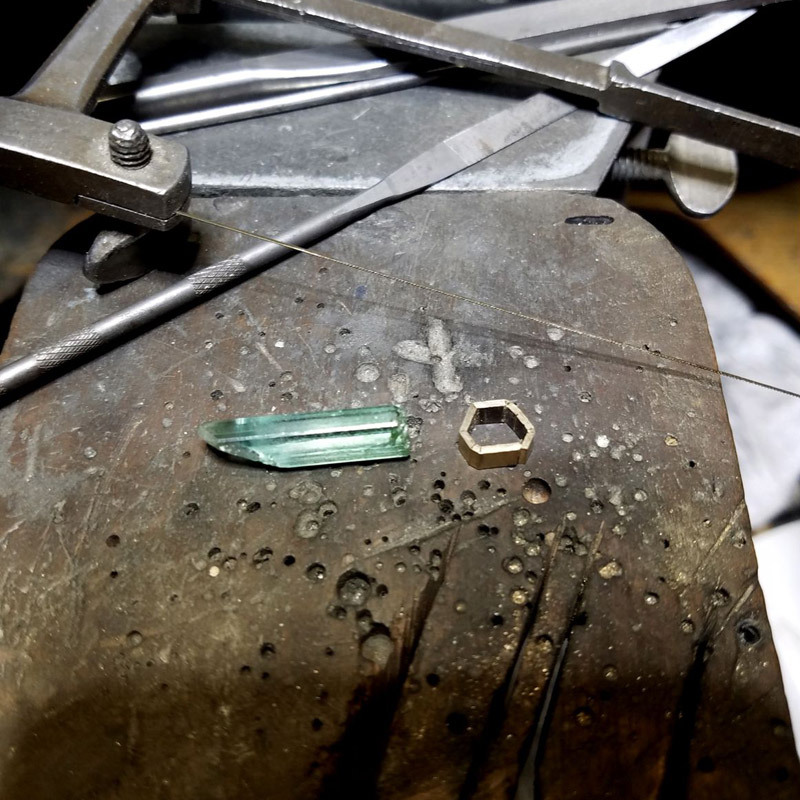 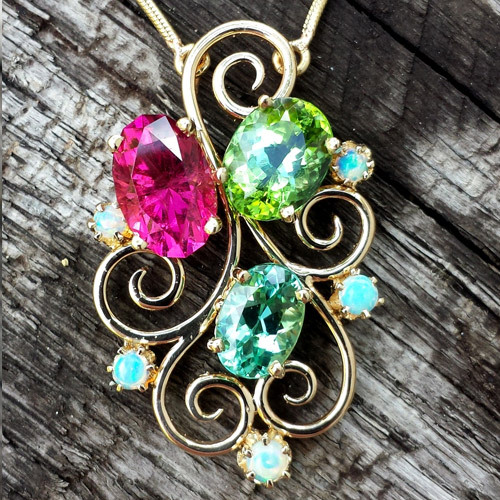 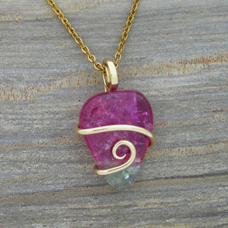 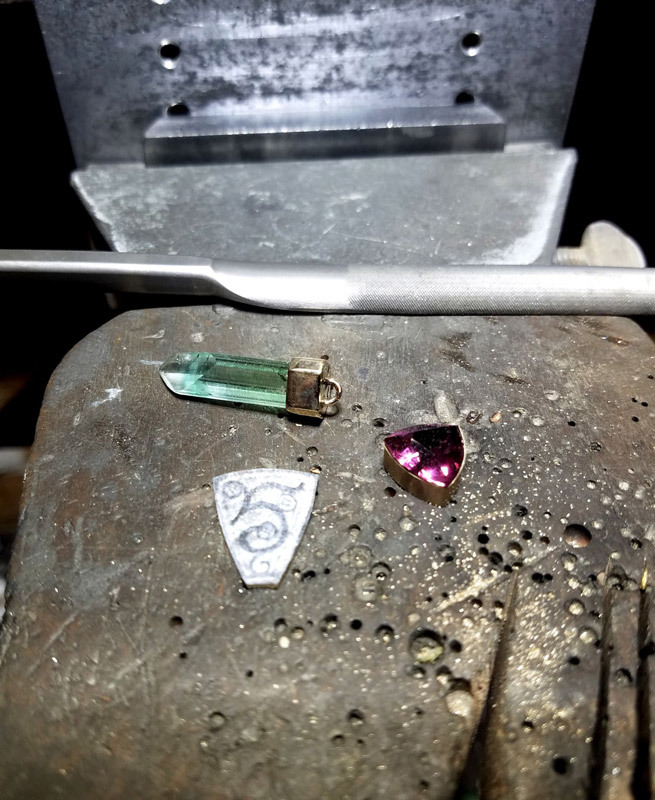 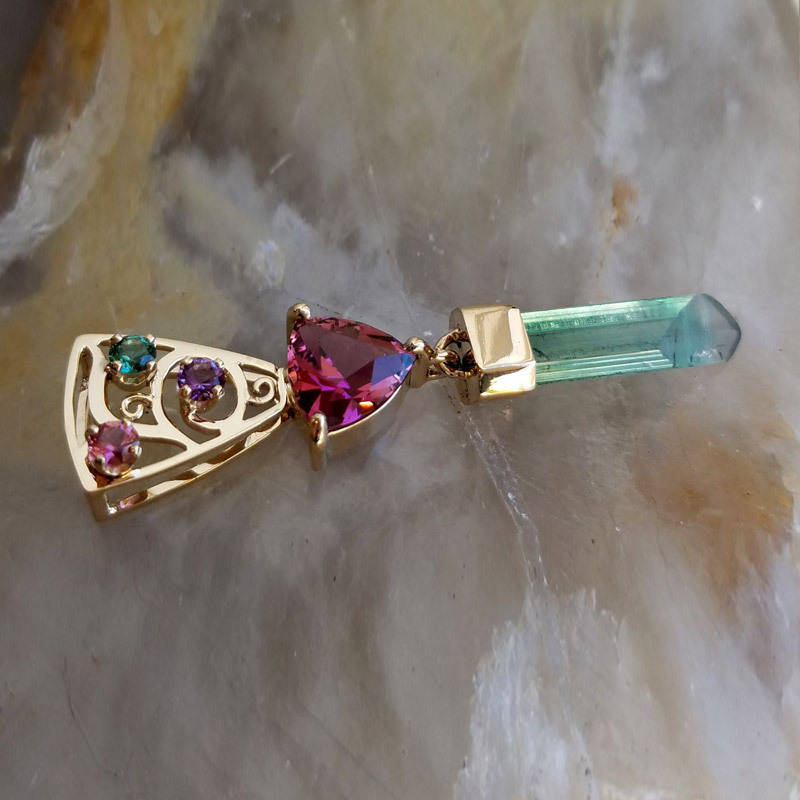 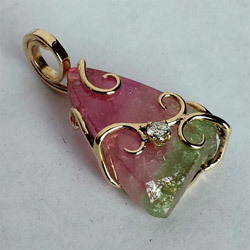 A few years ago, we created a custom pendant for the owner of the Mount Mica tourmaline mine using a suite of tourmaline gemstones he had found, including a wonderful terminated tourmaline crystal. 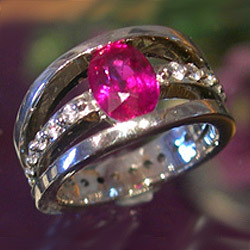 We put it on our website where it was admired by many visitors to the page. 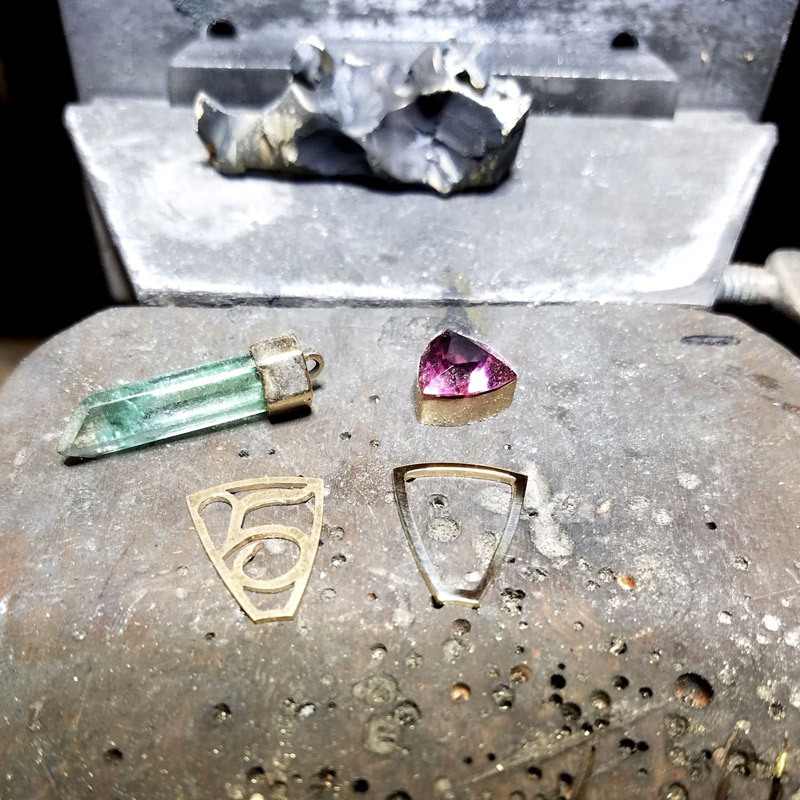 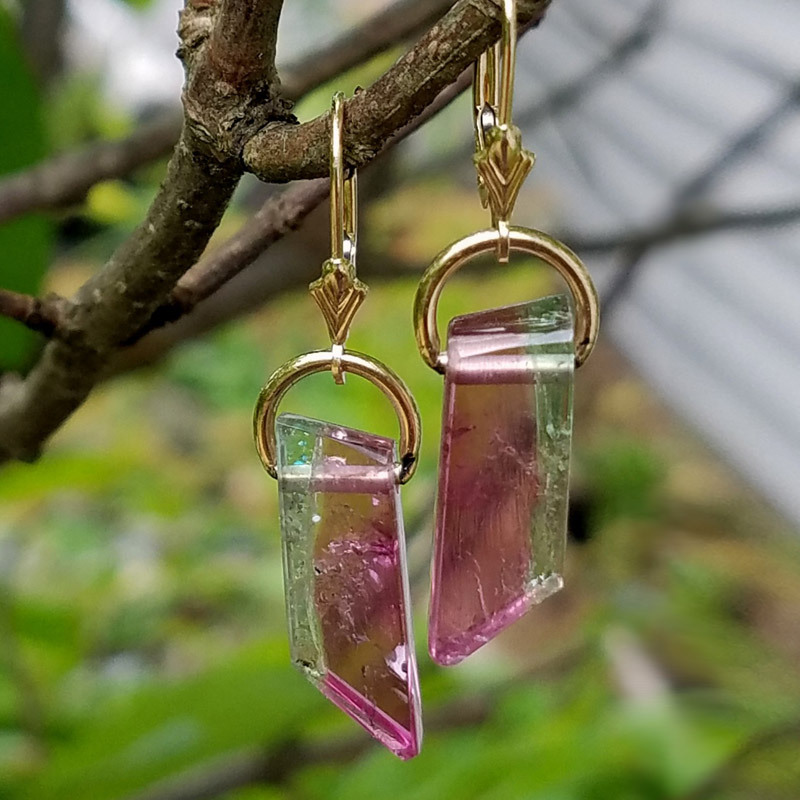 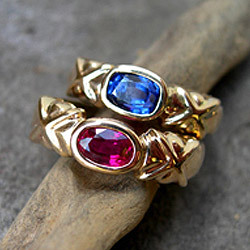 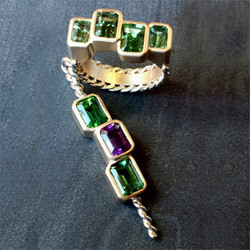 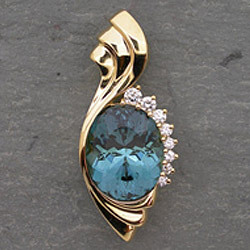 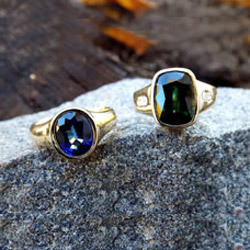 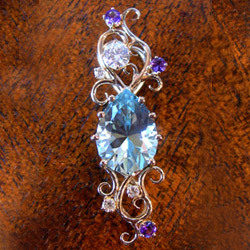 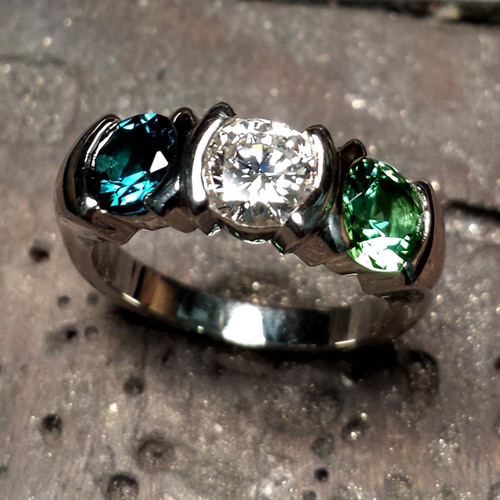 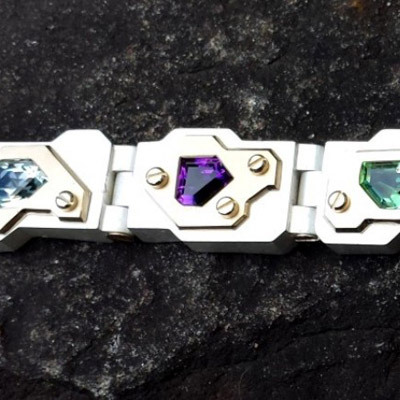 Last year, one of our very good customers who has a deep passion for Maine gemstones liked it so much that she asked us to design a similar one for her using three Dunton Quarry tourmalines, including a terminated tourmaline crystal, one Mount Apatite tourmaline and a 4th of July amethyst. 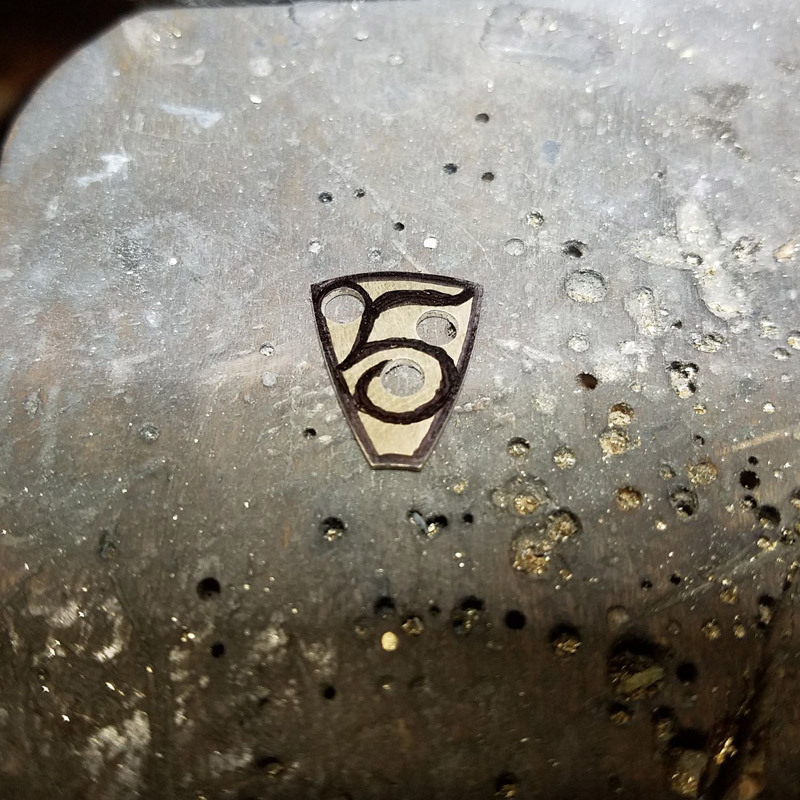 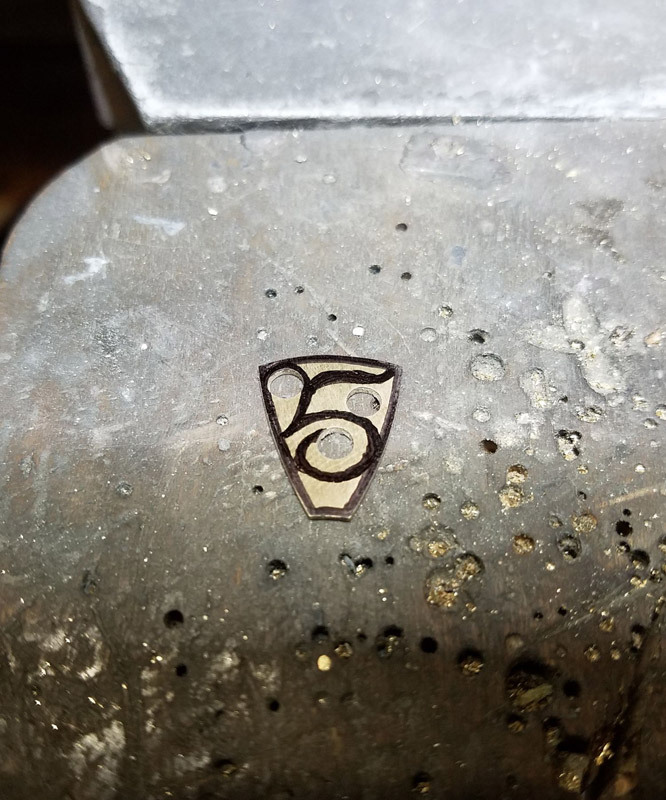 As a personal touch we incorporated the number five into the piece which had a significant meaning to her. 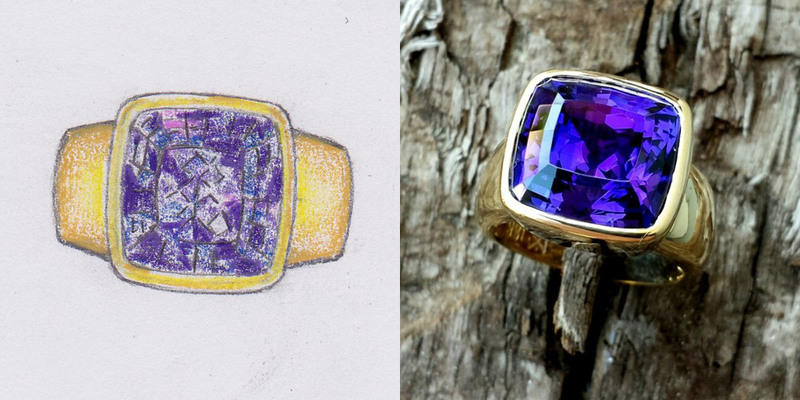 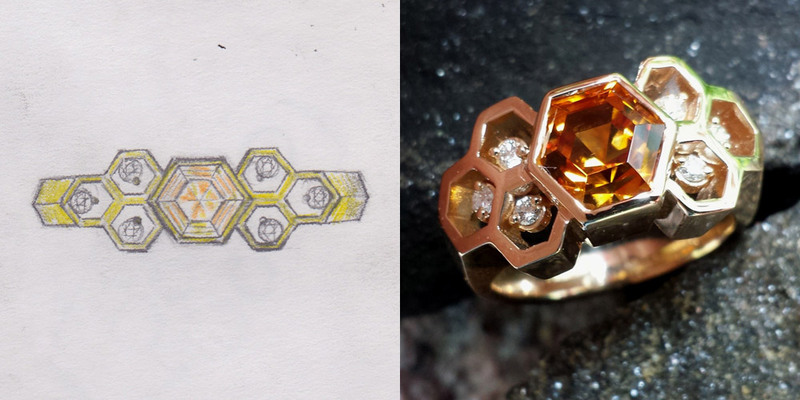 We documented the progression of the piece as it was created and took pictures of every step. 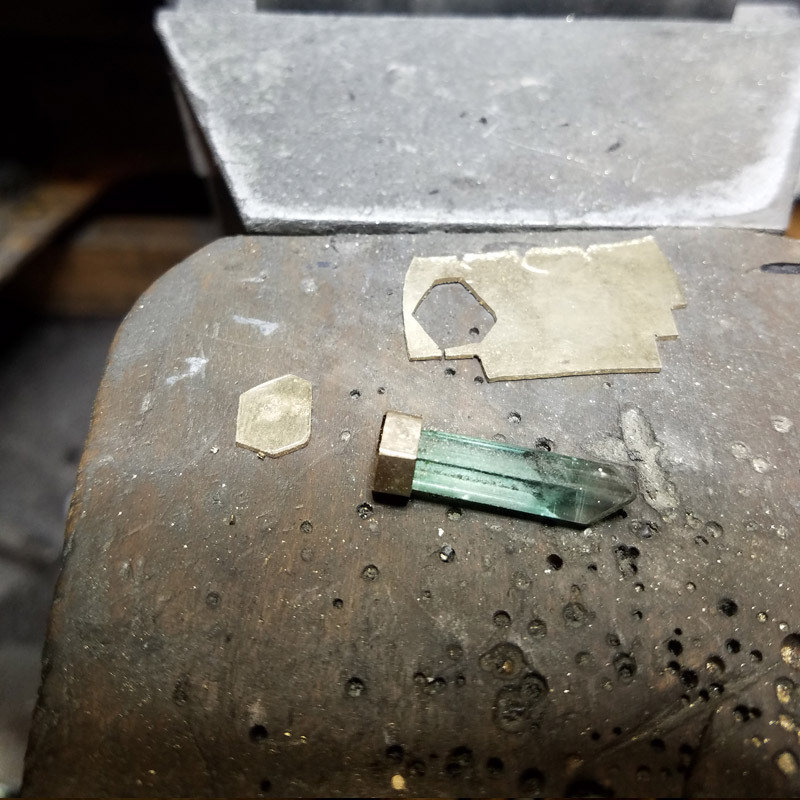 This is the process. 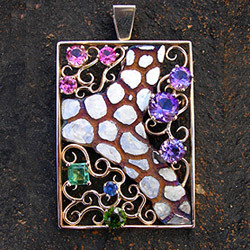 This was a piece created as a combination of many sentimentalities. 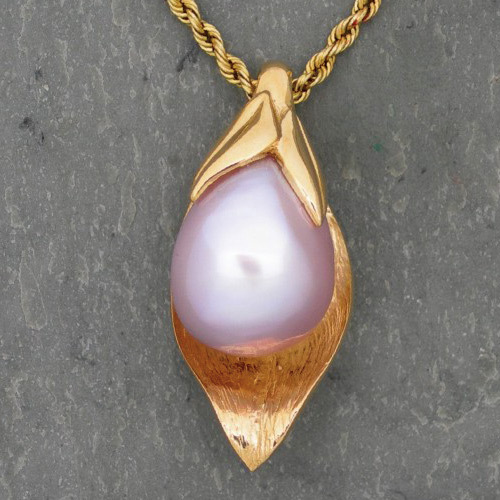 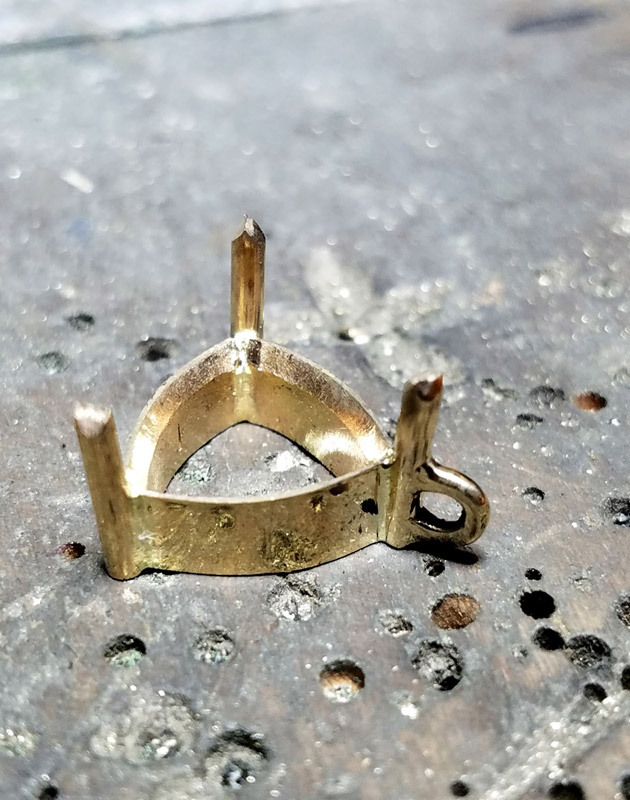 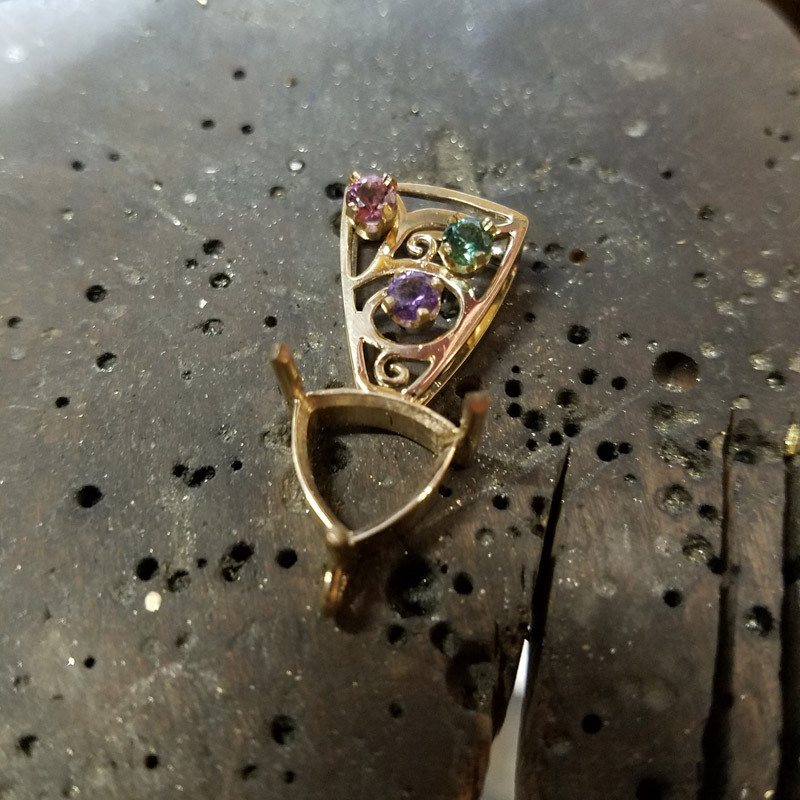 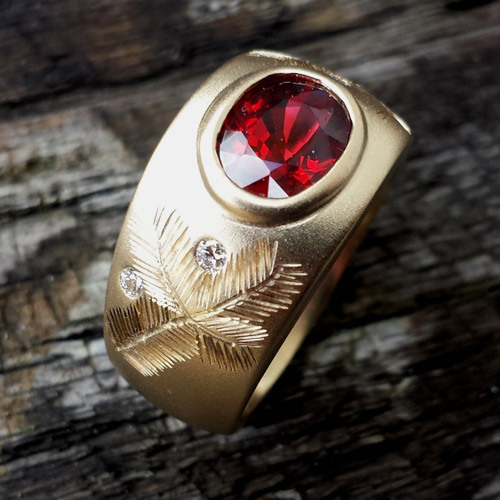 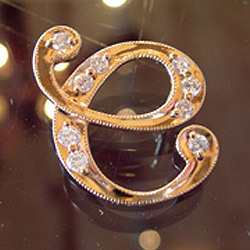 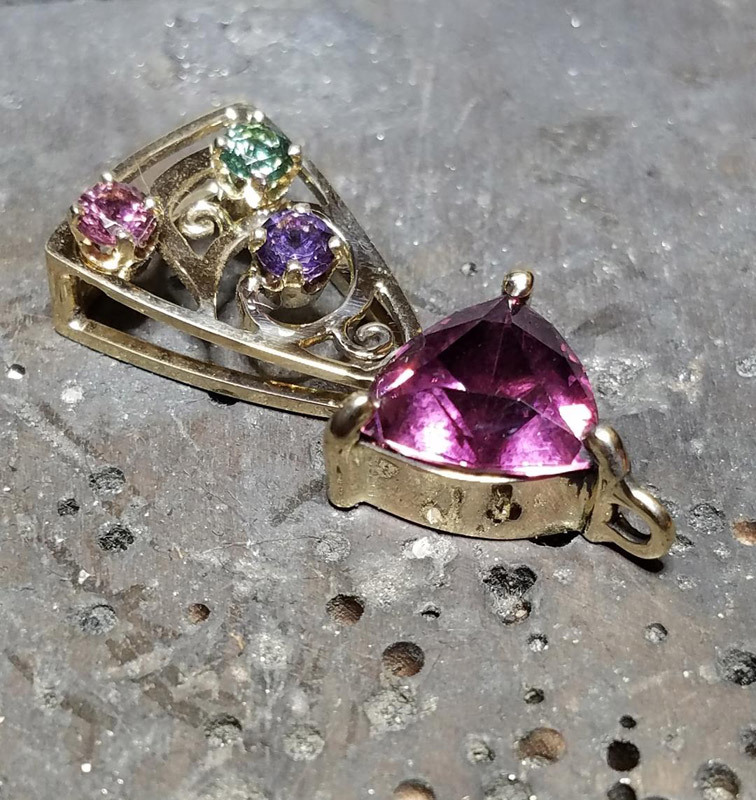 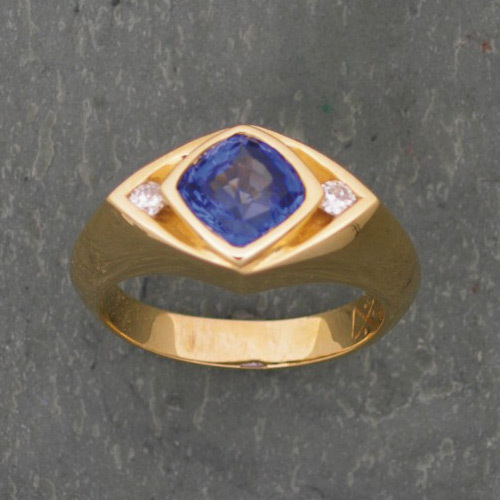 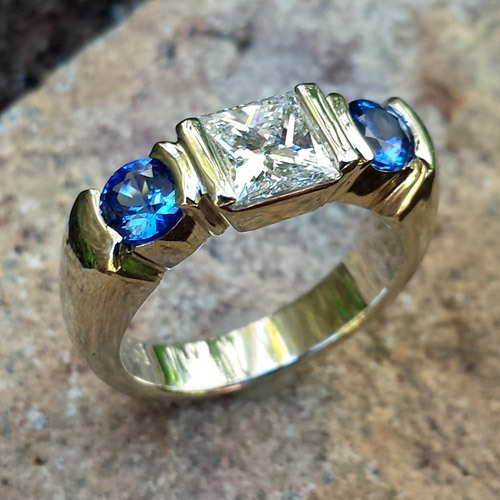 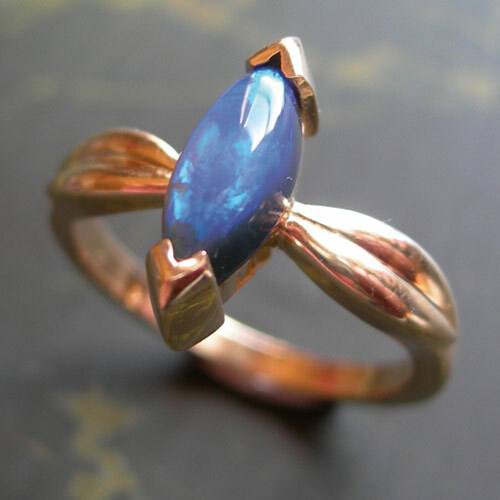 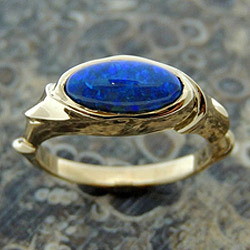 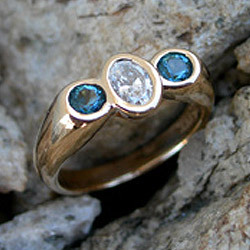 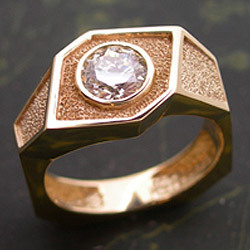 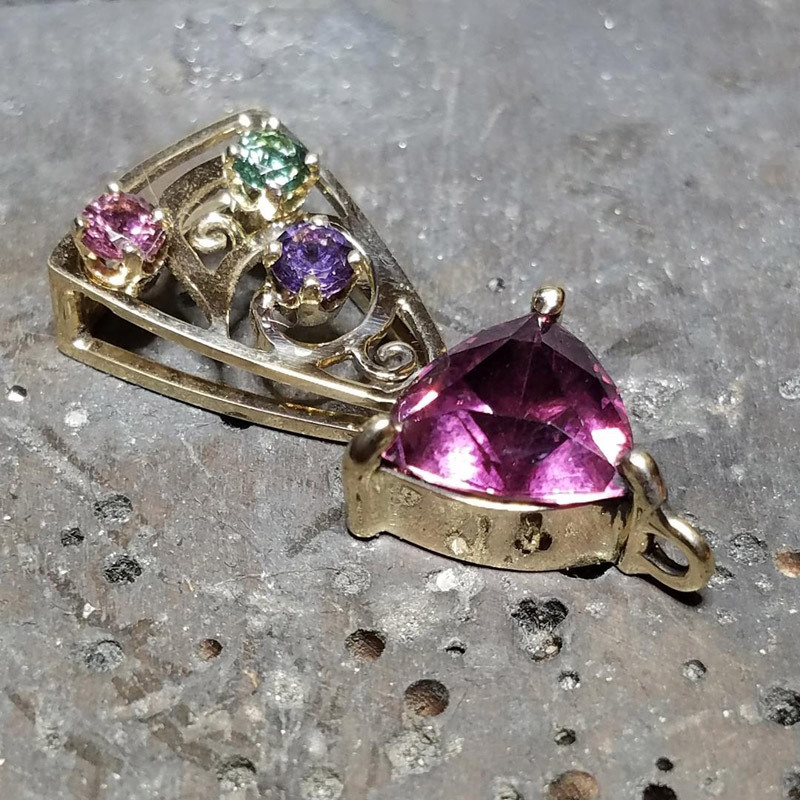 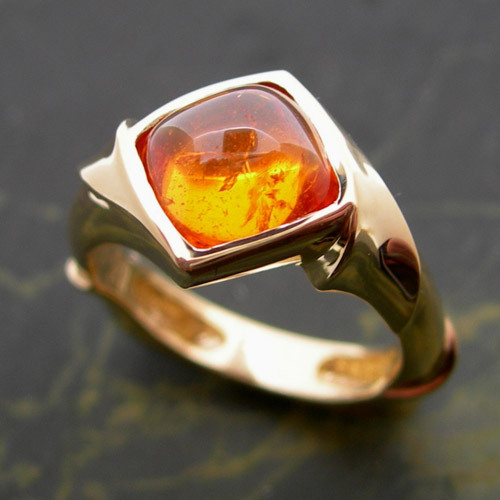 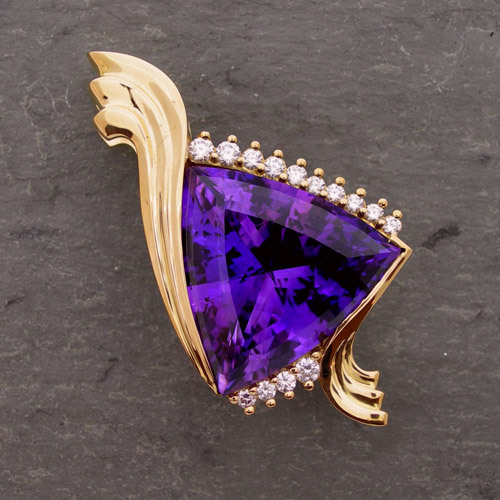 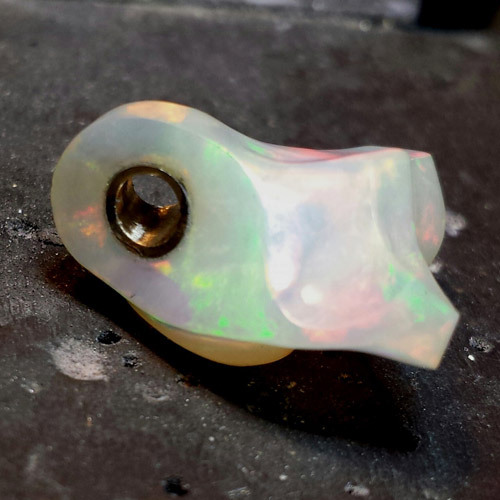 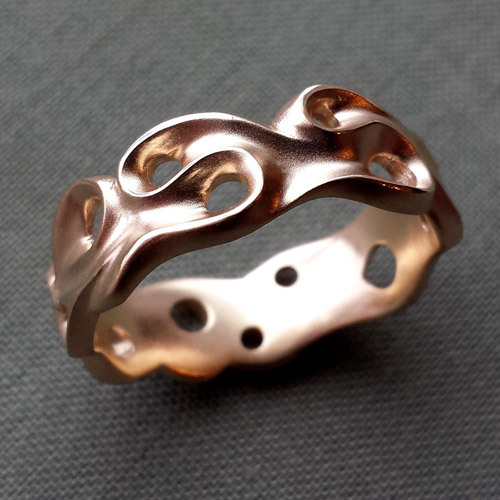 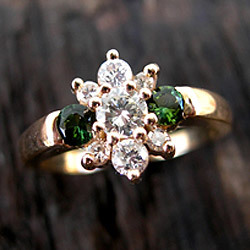 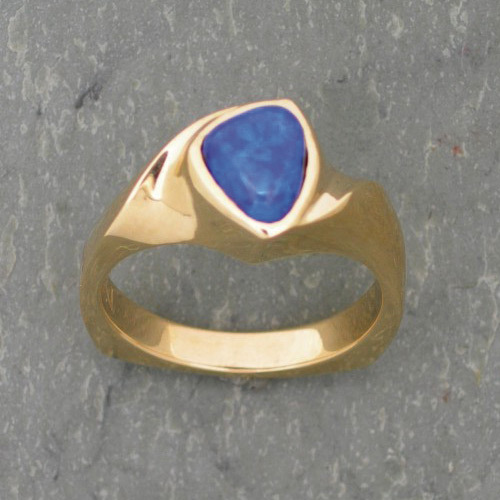 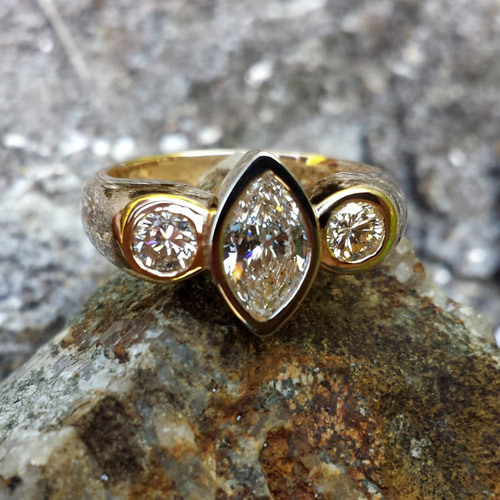 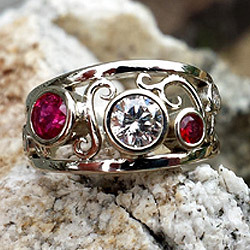 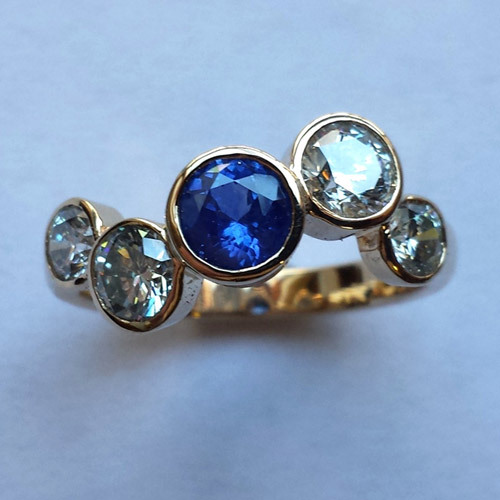 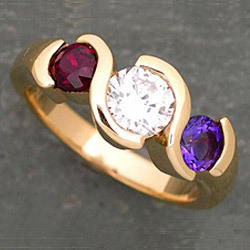 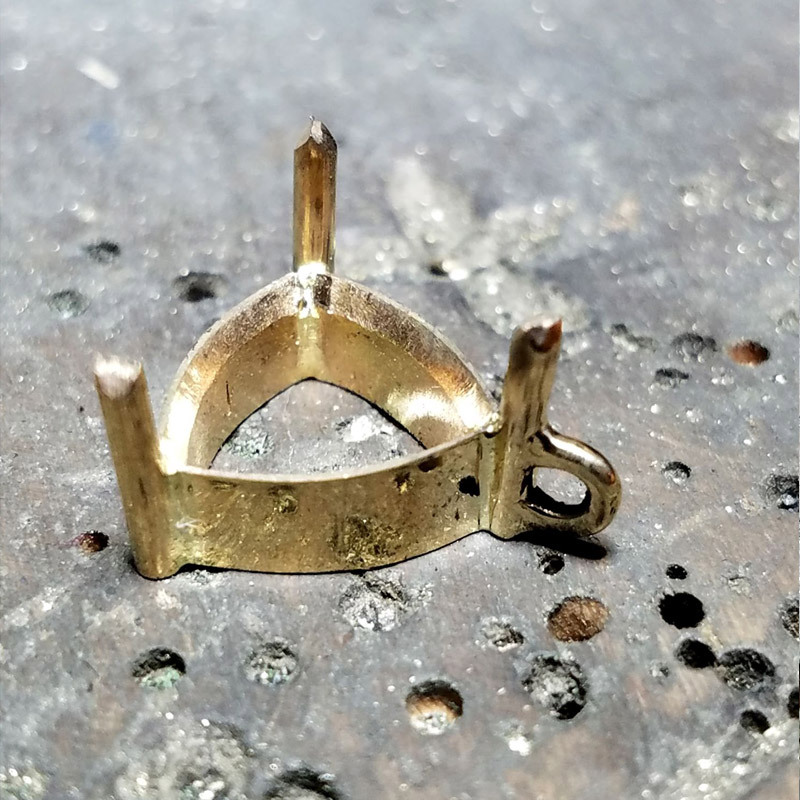 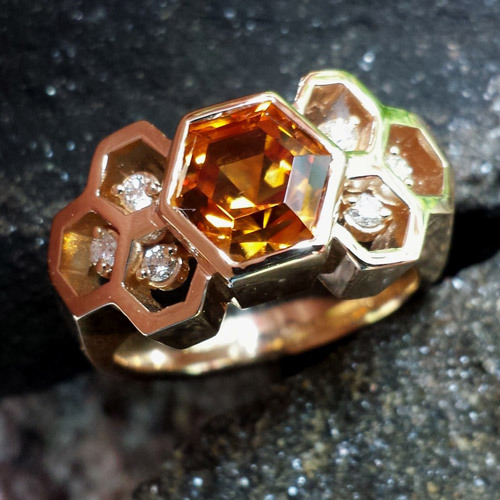 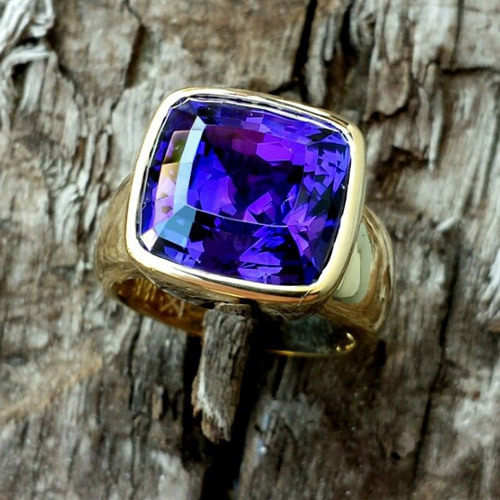 It was commissioned by a grandmother to-be for her unborn granddaughter using gold from her husband's wedding ring to be eventually presented as an heirloom piece. 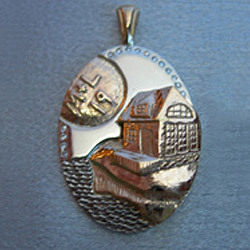 The baby's father was enthralled with sharks and they wanted to symbolize Maine somehow. 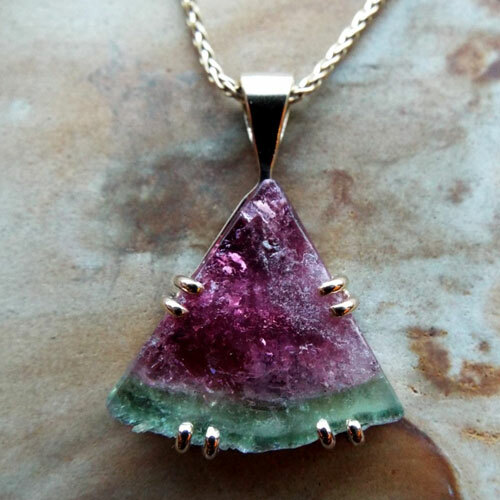 The shark fin shaped watermelon slice was something we created from Newry, Maine Tourmaline a year prior and everything fell in place. 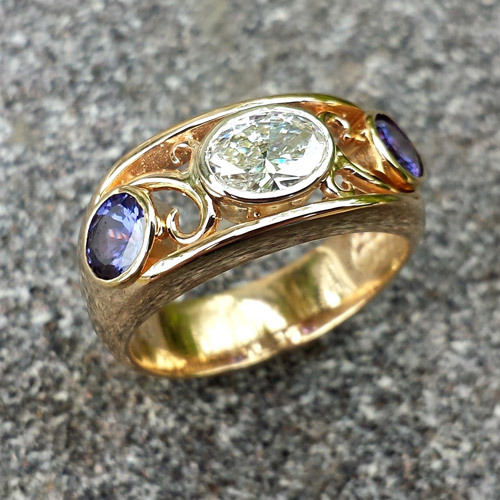 We added accents of sapphires and diamonds to simulate sunlight on the wake currents as the fin moved through water. 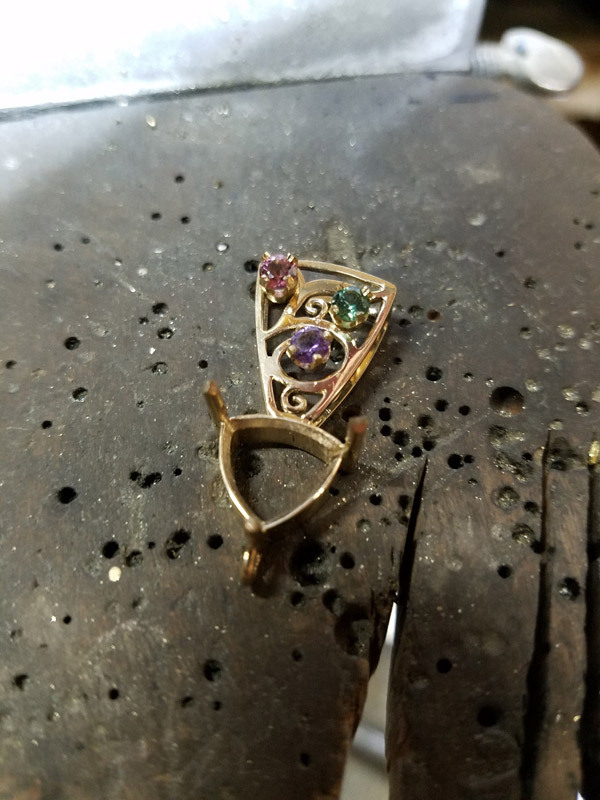 An all together wonderful and satisfying project. 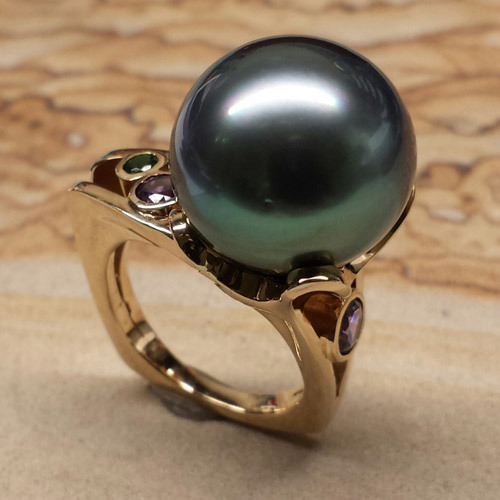 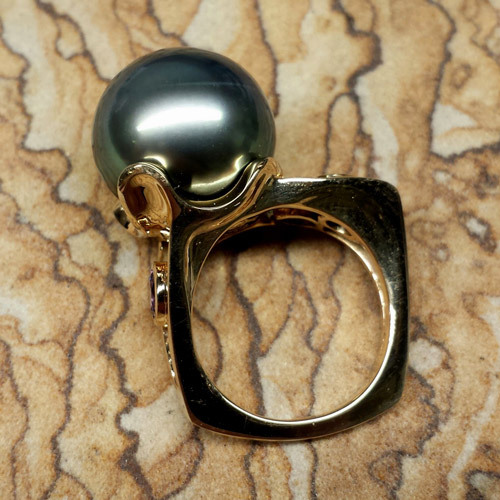 15+ mm Tahitian Black Pearl set in a custom 14k yellow gold ring setting with Purple Spinel, Purple Sapphire and Chrome Tourmaline. 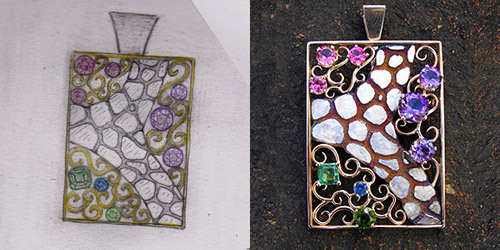 I was trying for something unexpected, Art Nouveau influences but a Contemporary feel. 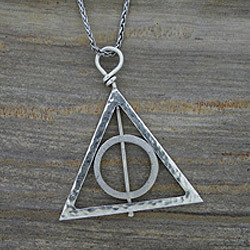 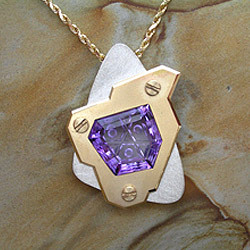 Something utterly unique but comfortably wearable. 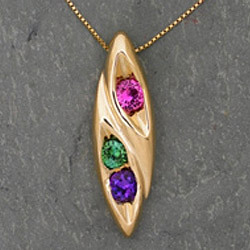 Something tasteful and yet colorful and fun. 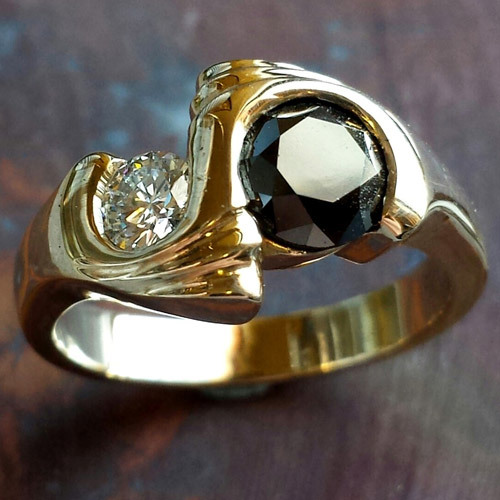 And of course something to showcase a huge, impressive Black Pearl. 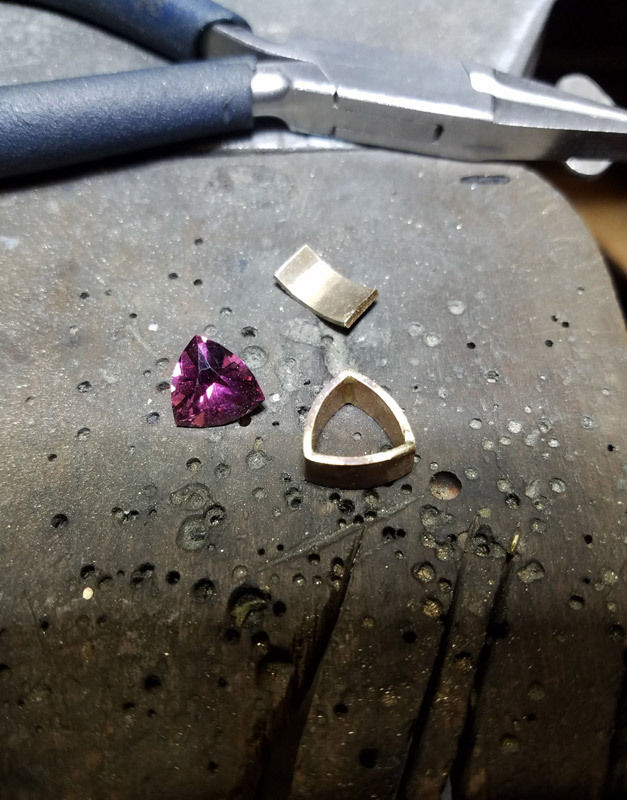 I'm pretty happy with the results. 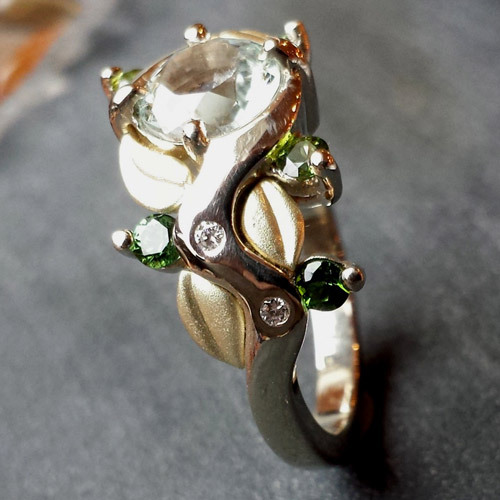 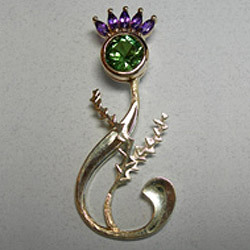 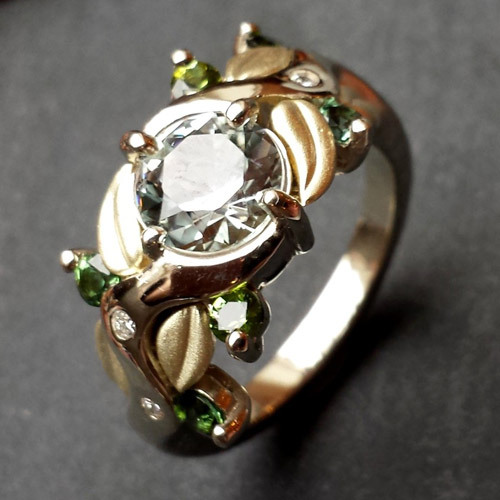 Custom engagement ring using vine and leaf motif set with tourmalines and diamonds. 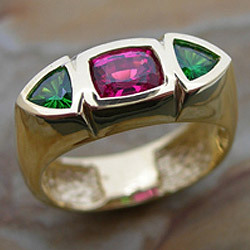 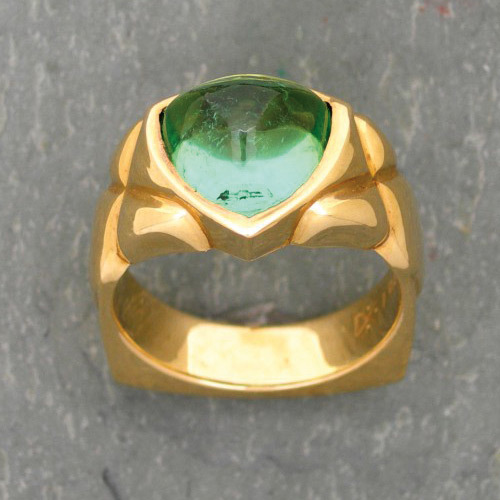 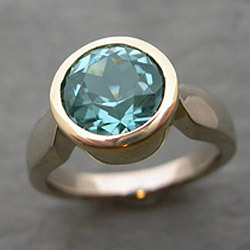 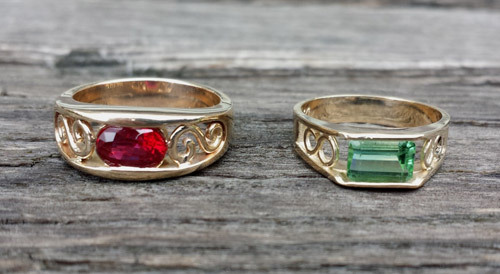 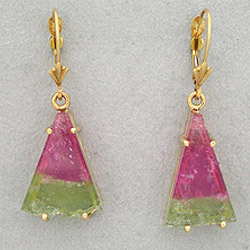 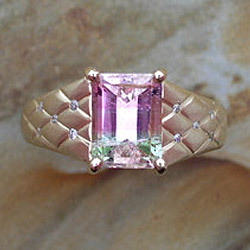 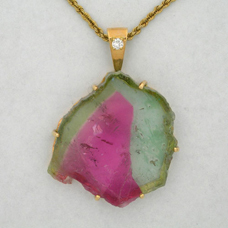 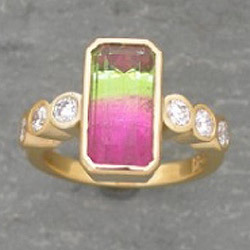 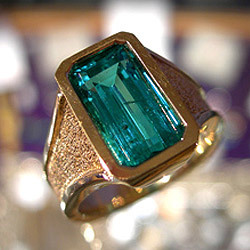 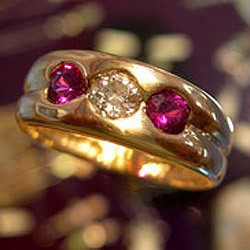 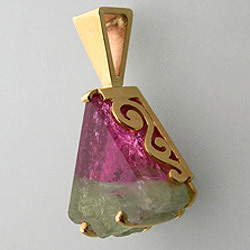 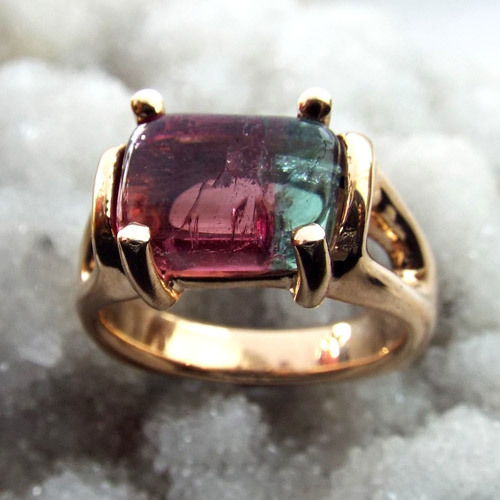 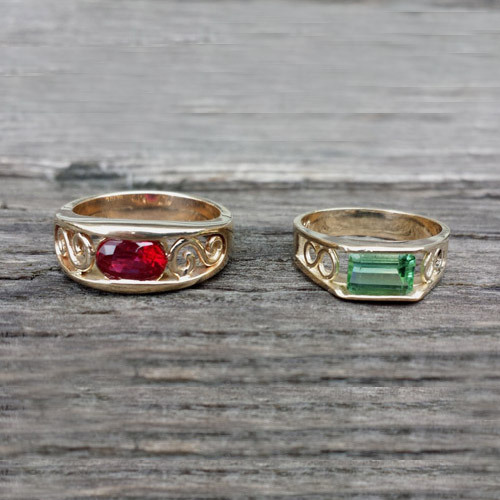 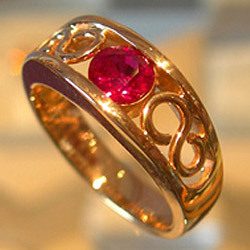 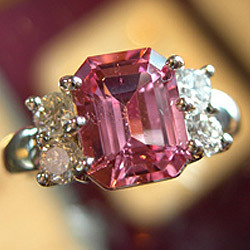 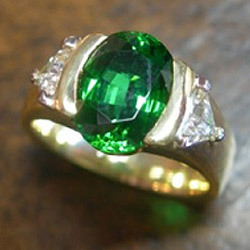 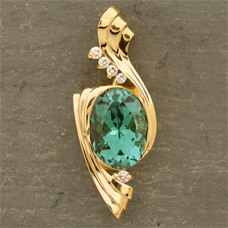 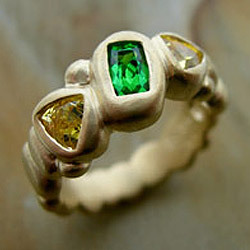 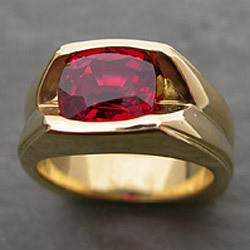 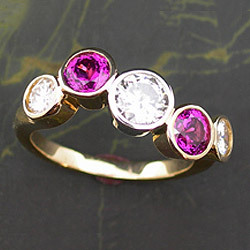 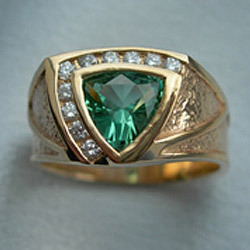 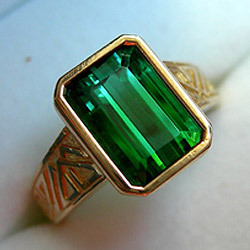 The center stone is a rare colorless tourmaline from the world famous Mount Mica mine in Paris, Maine. 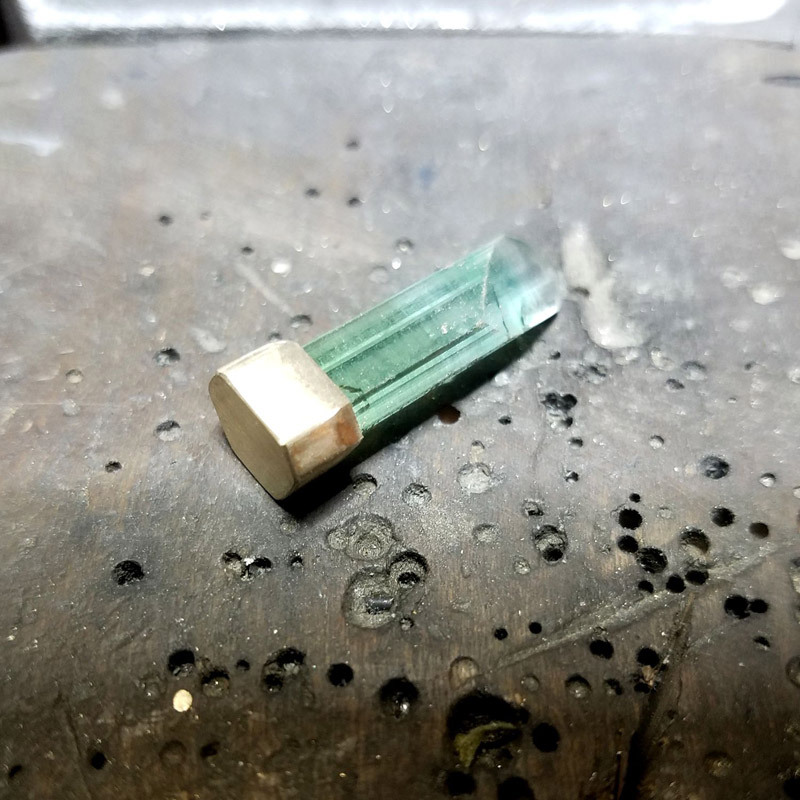 Our customer wanted to use a Maine gemstone as a center stone. 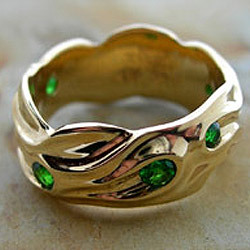 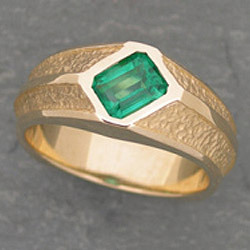 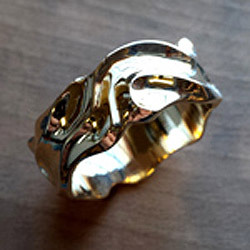 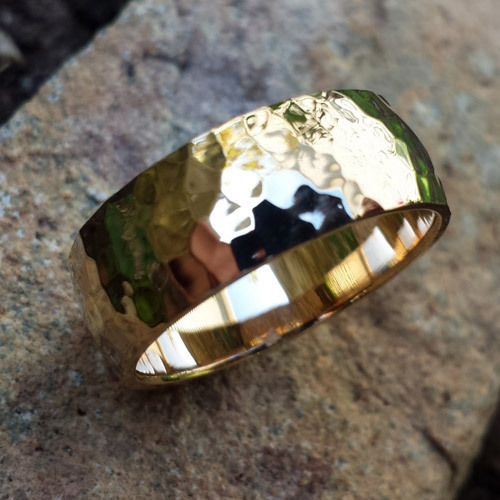 The leaves are matte finish green gold, individually hand carved and assembled. 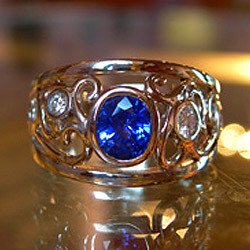 The vine part of the ring is white gold. 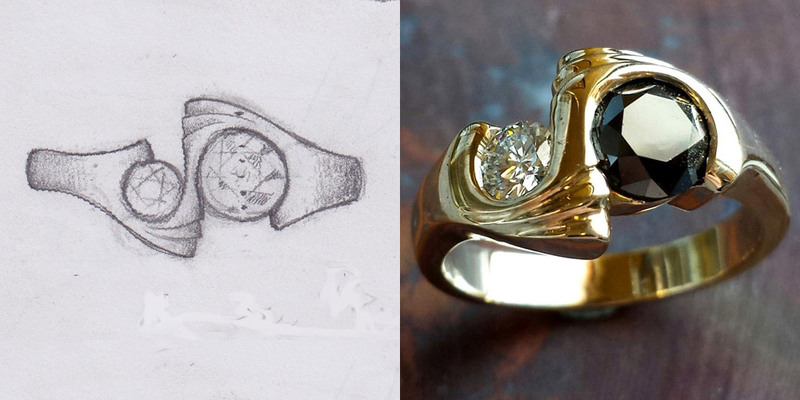 A very unique approach to a traditional engagement ring and unforgettable. 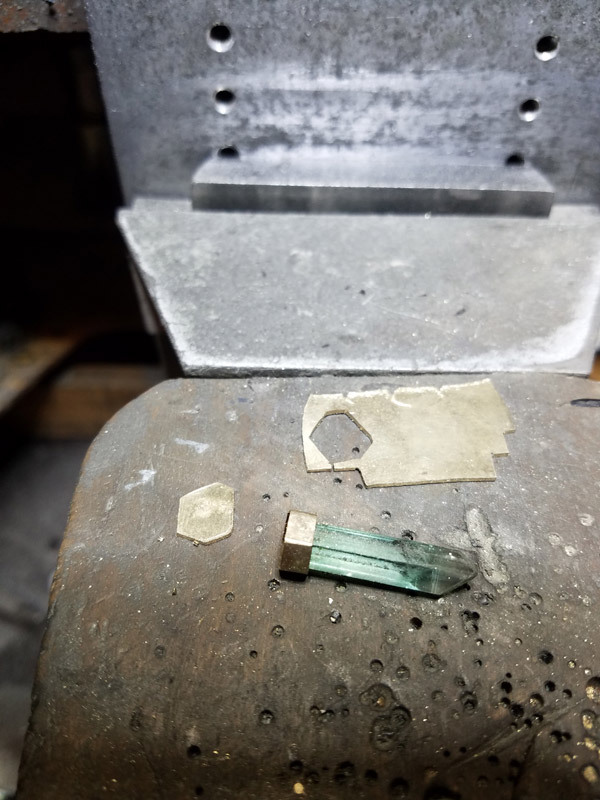 Thank you Mandy and Randy! 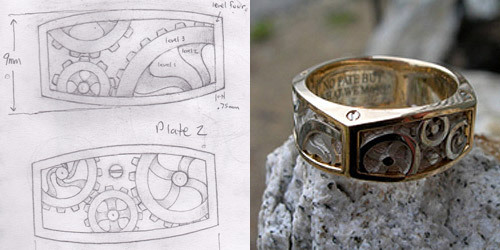 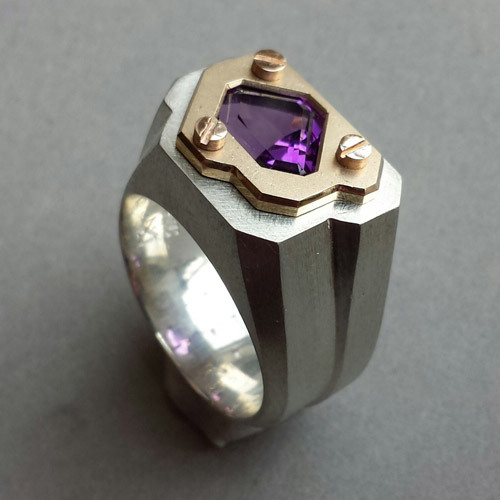 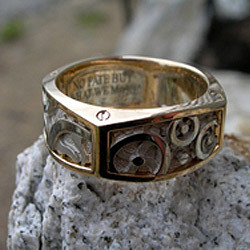 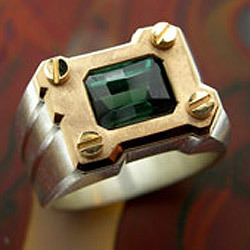 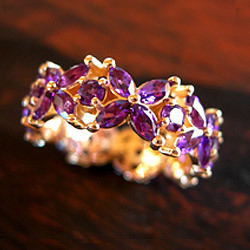 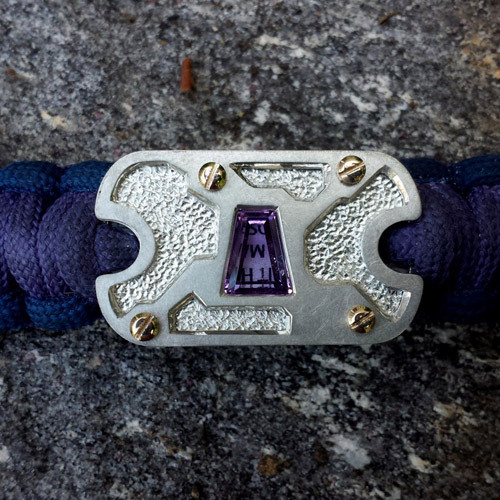 Steampunk style men's ring in sterling silver, 14k yellow gold, 14k rose gold and 4th of July Amethyst. 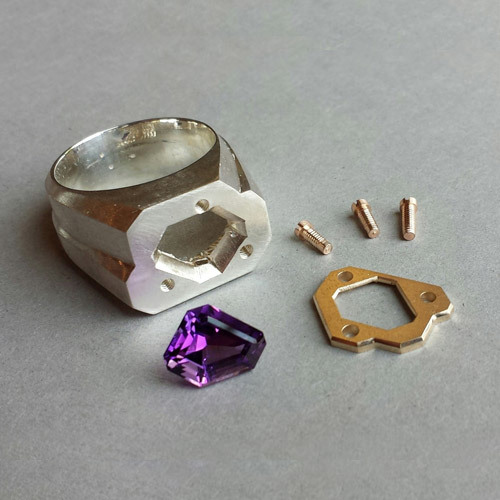 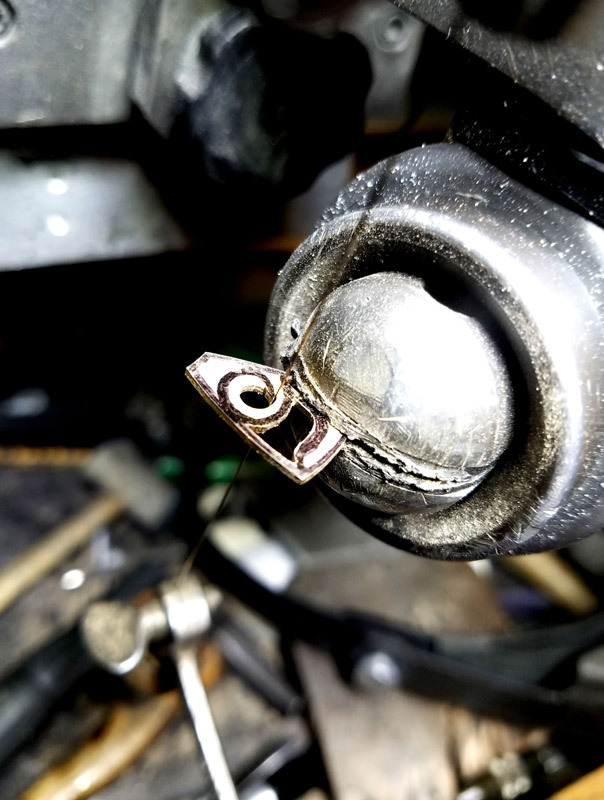 Screws are fully functional, stone is held in with the plate, the ring can be disassembled and reassembled with a small screw driver. 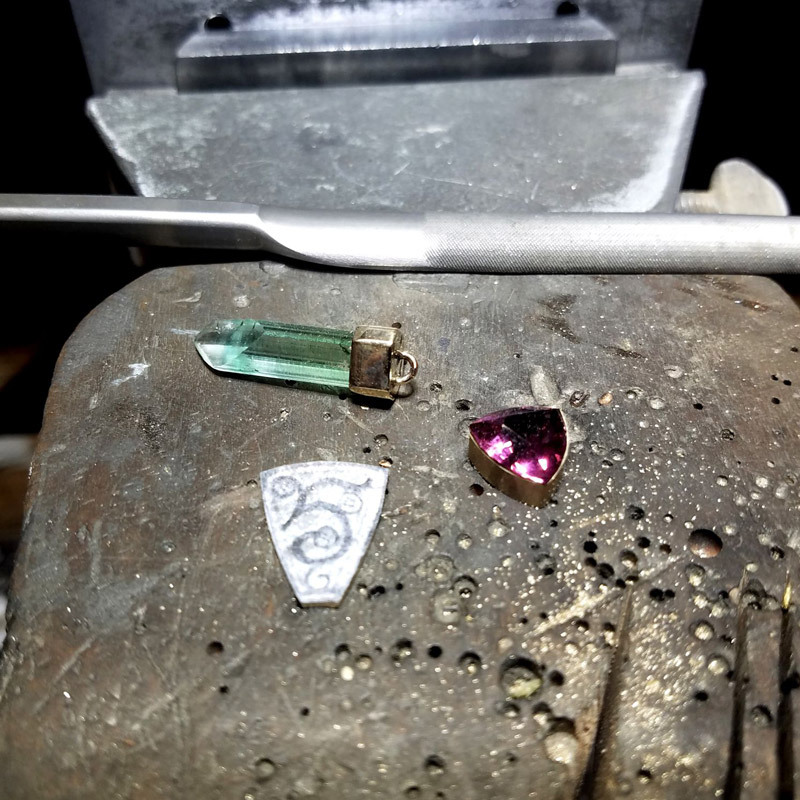 Very very fun project, thank you Heather and David! 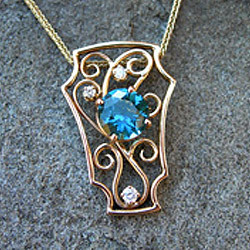 Dennis recently designed this piece as a personal challenge. 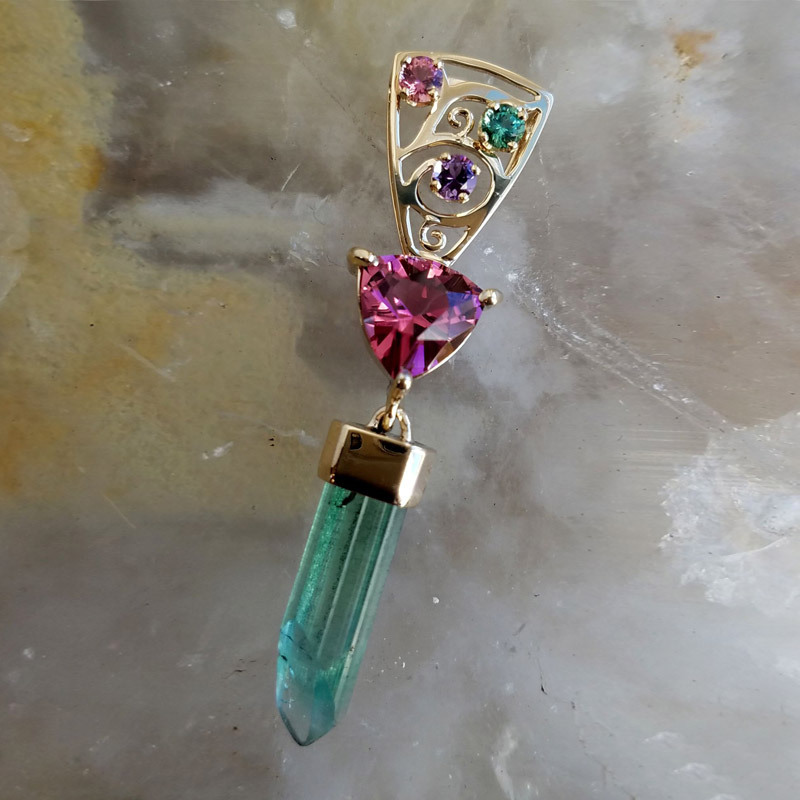 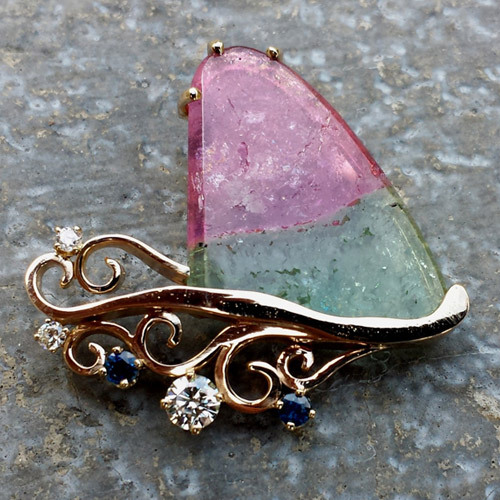 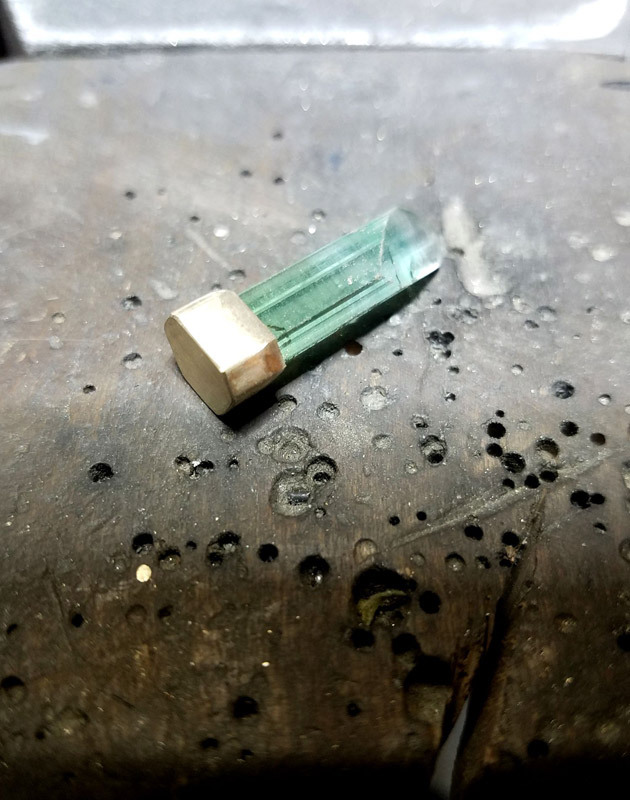 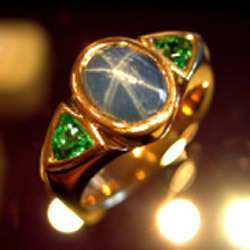 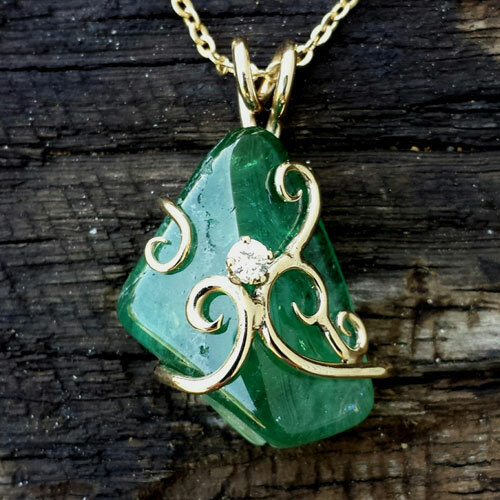 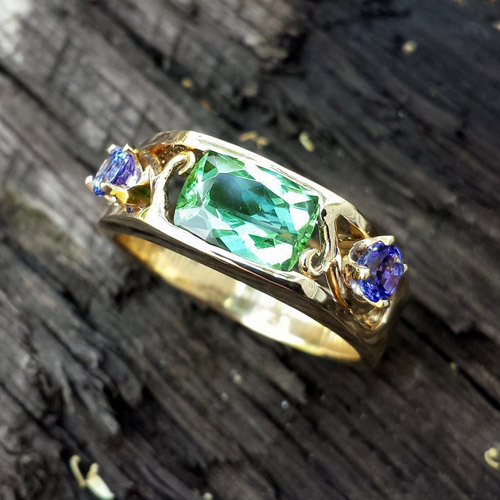 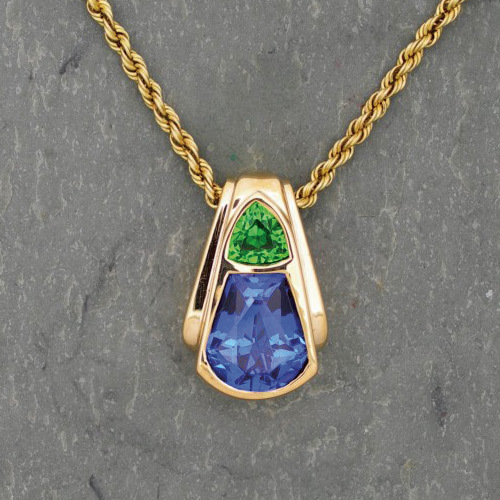 The idea was to create it using two types of gems that were not usually found together in the same setting, green tourmaline from Maine and Lapis from the Middle East. 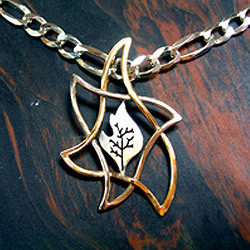 In addition, Dennis wanted to use total hand-construction techniques to build it, including the chain. 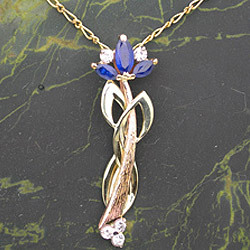 Finally, he wanted to begin the exploration of a different Art Nouveau style, as seen in the "ribbon" going across the Lapis cab. 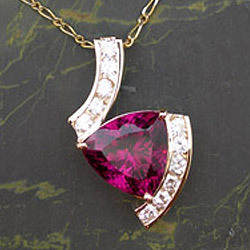 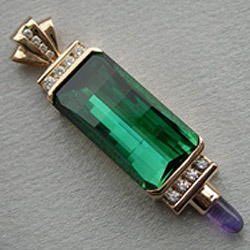 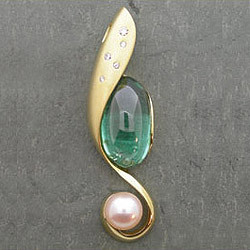 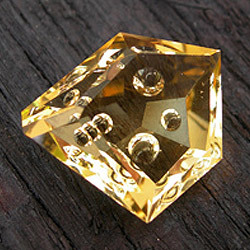 The tourmaline trillion-cut gemstone is attached to the bottom of the ribbon with a small hinge and moves front to back. 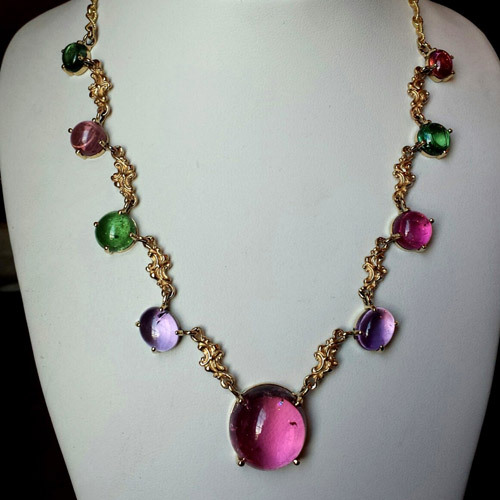 The chain is hand-constructed from about 5 feet of 14k gold wire and assembled in a link system that Dennis saw in a chain at a vintage jewelry exhibit at the Boston Museum of Fine Art. 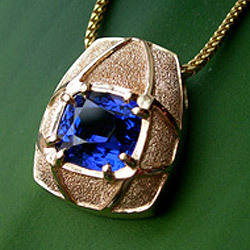 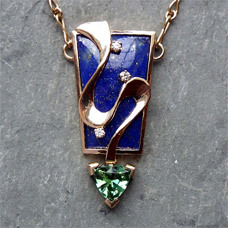 This pendant is 14k yellow gold with a 1.5ct Maine Tourmaline and a trapezoid shaped Lapis which is deep blue with pyrite flecks. 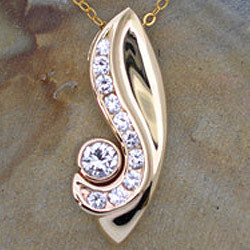 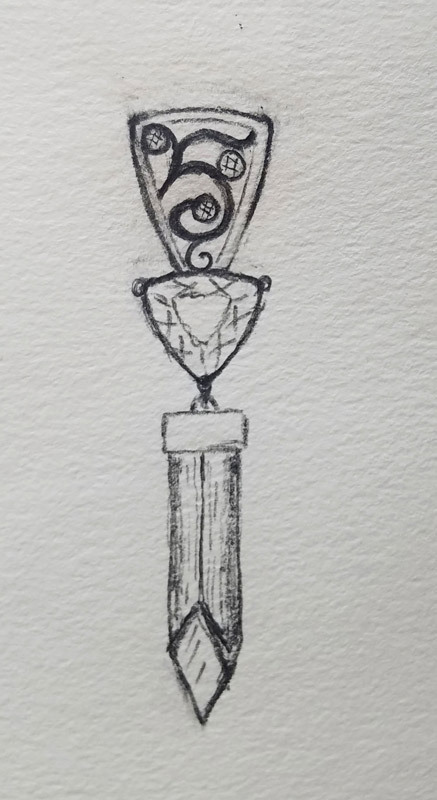 The ribbon is accented with three diamonds. 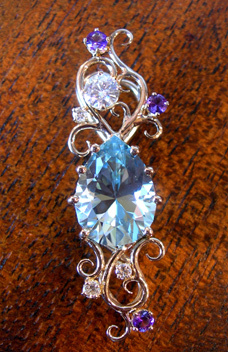 It was one of the most beautiful and unique pieces in our inventory. 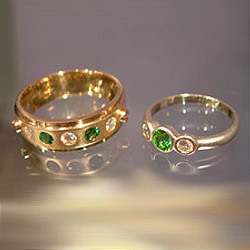 Thank you, Helen and Rob!! 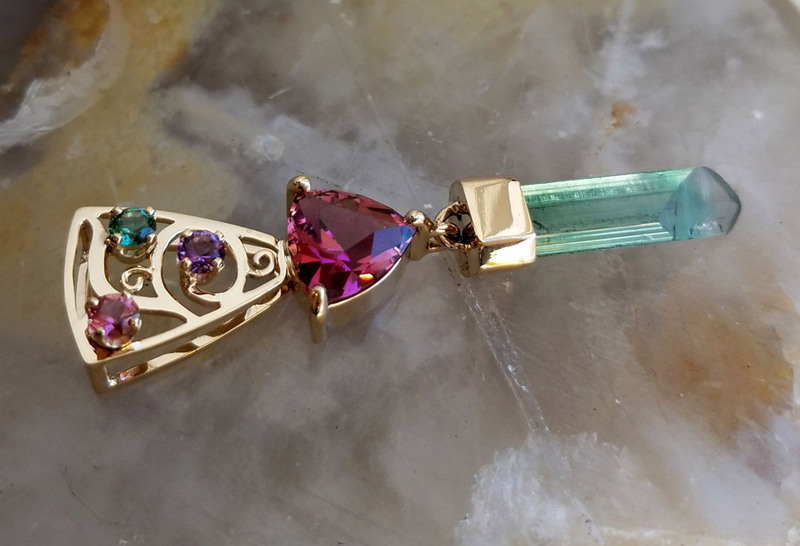 One of a kind 18k yellow gold pendant set with 4.76ct Mount Mica teal tourmaline mined in 2004 and accented by VS clarity diamonds. 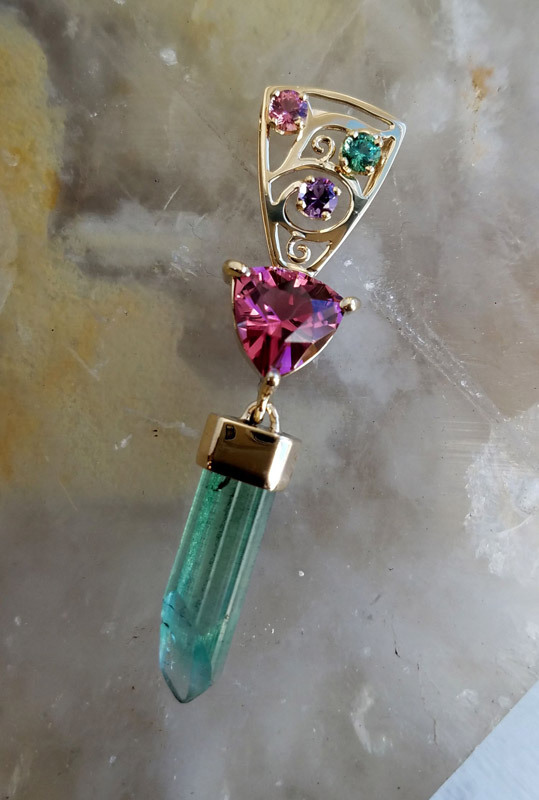 One of our unique pieces. 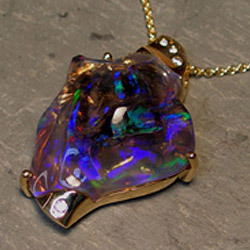 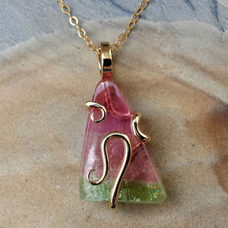 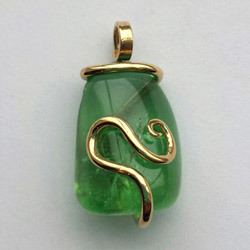 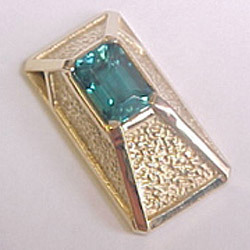 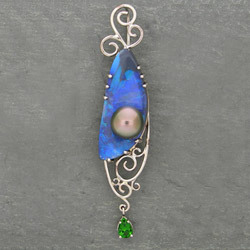 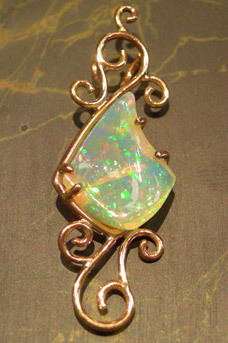 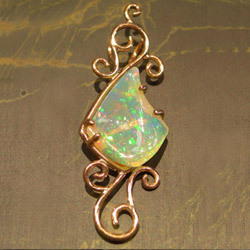 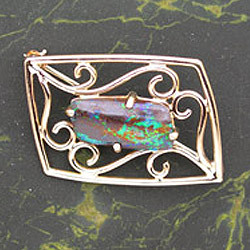 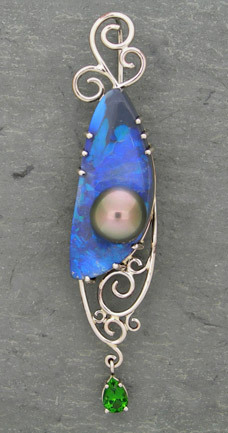 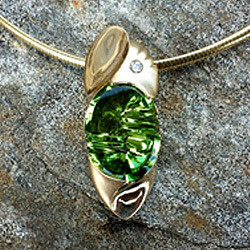 This piece is part of the Maine gemstone necklace project, for further details please go to our "special projects" page. 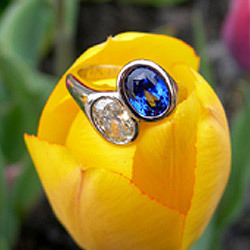 Click the photos below for enhanced view and descriptions. 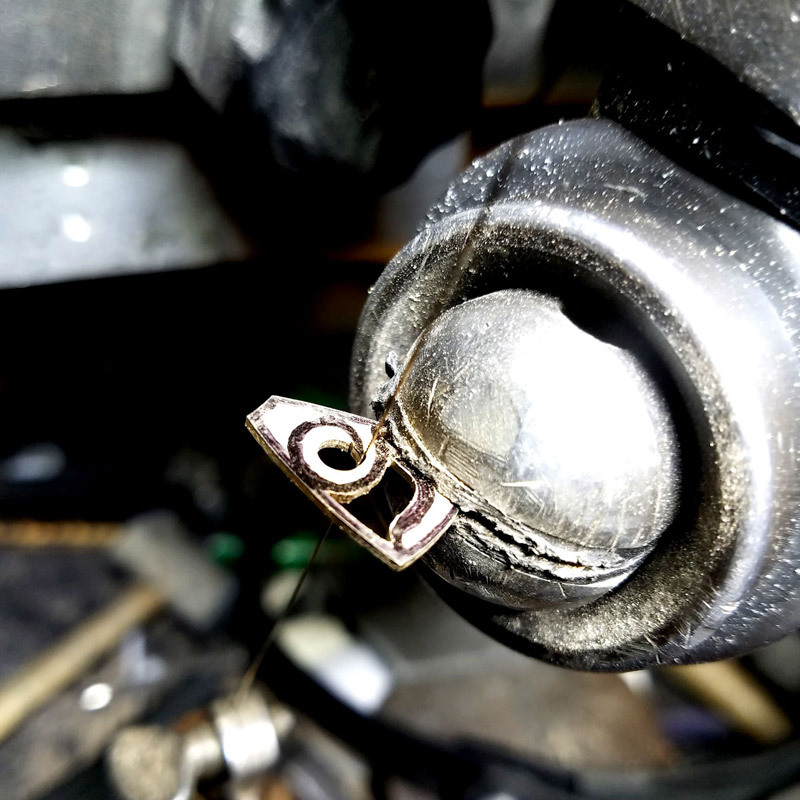 Mobile users: Click any photo to open gallery. 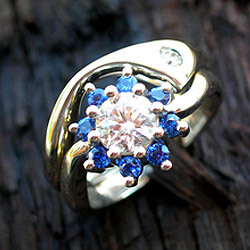 Swipe left/right to browse, tap to show/hide captions, swipe down to exit.